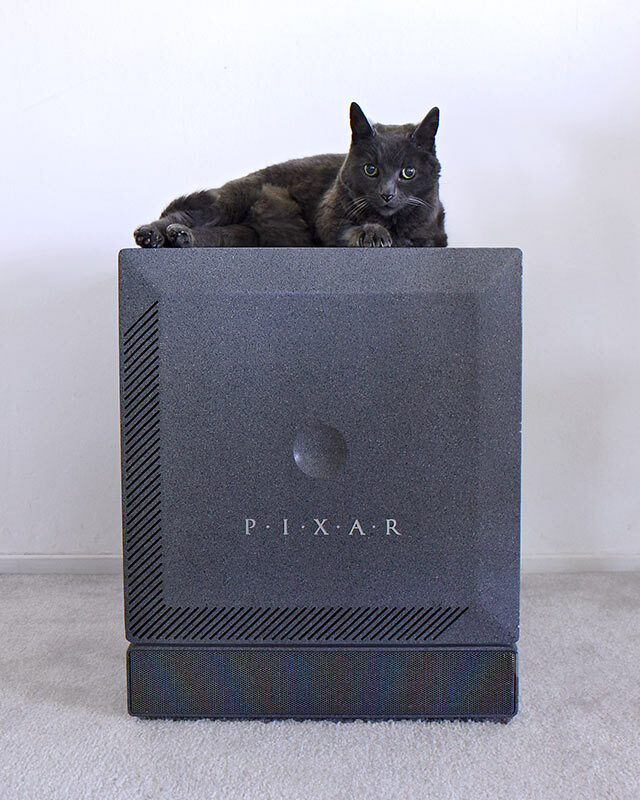 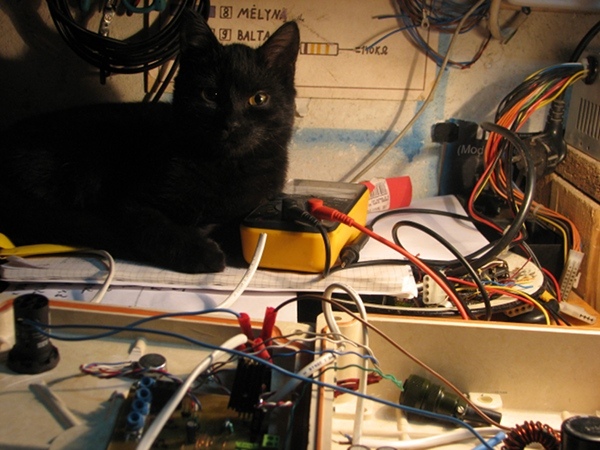 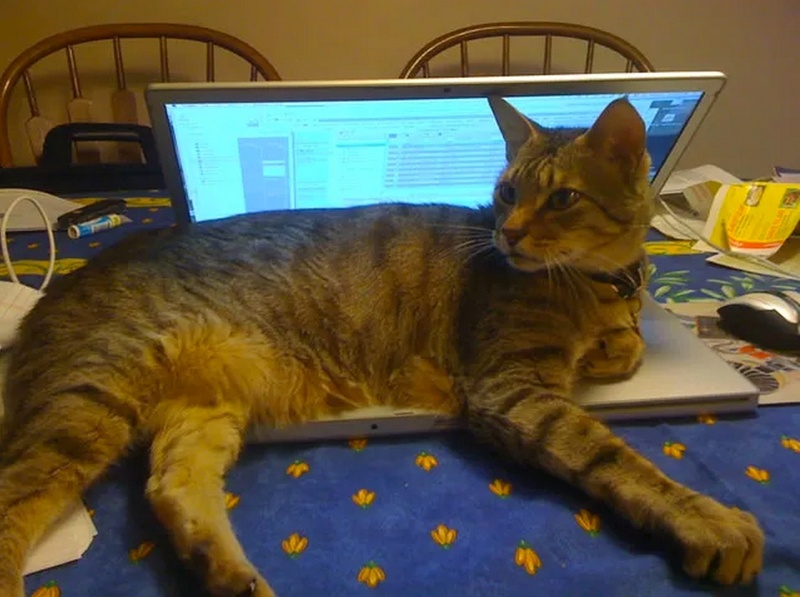 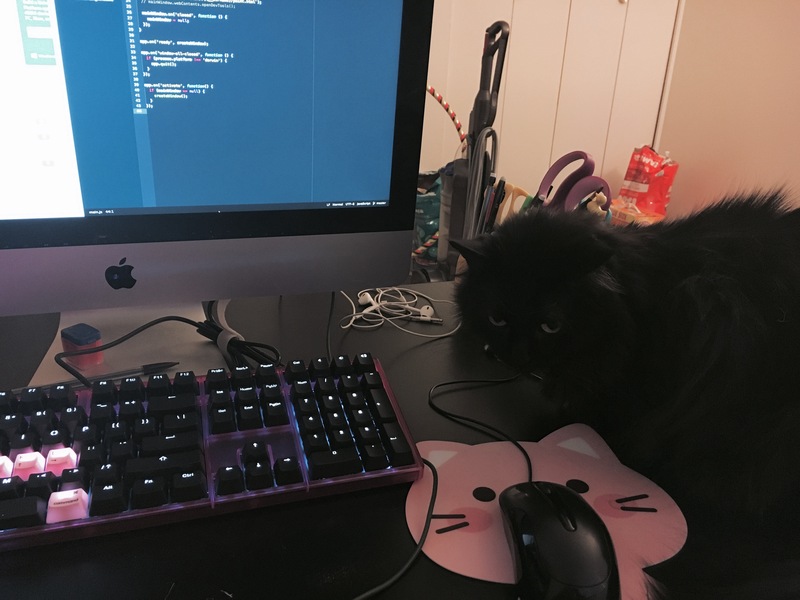 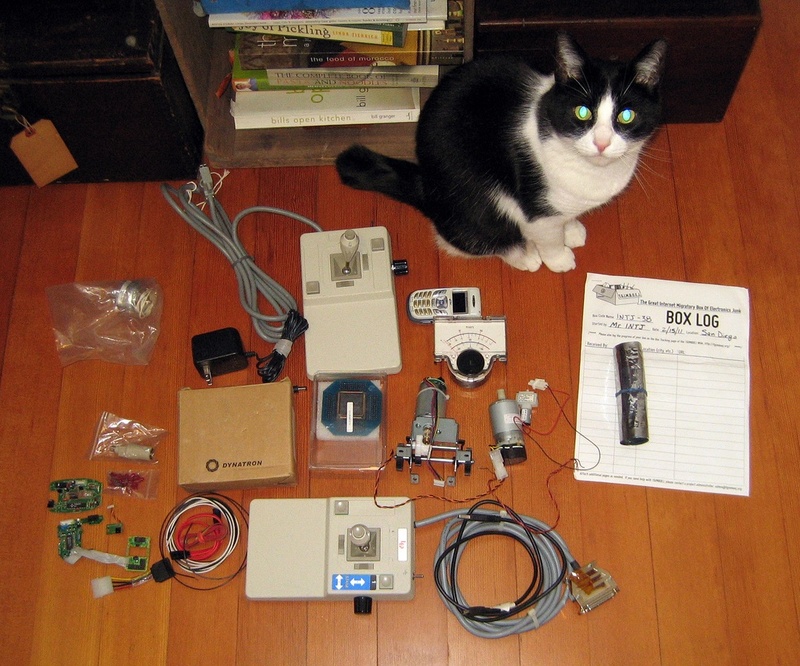 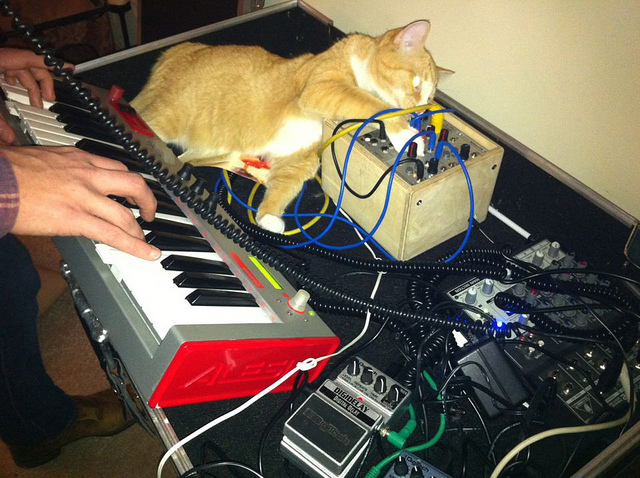 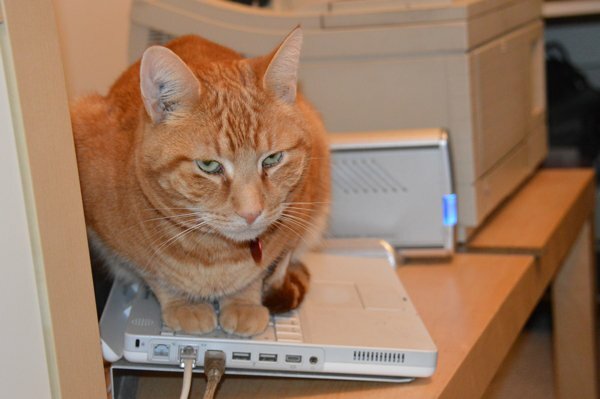 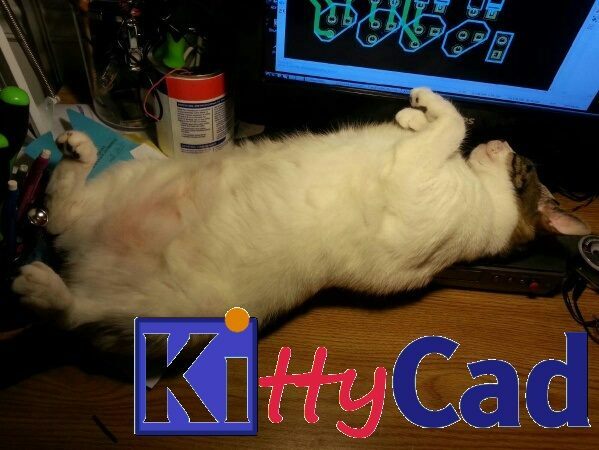 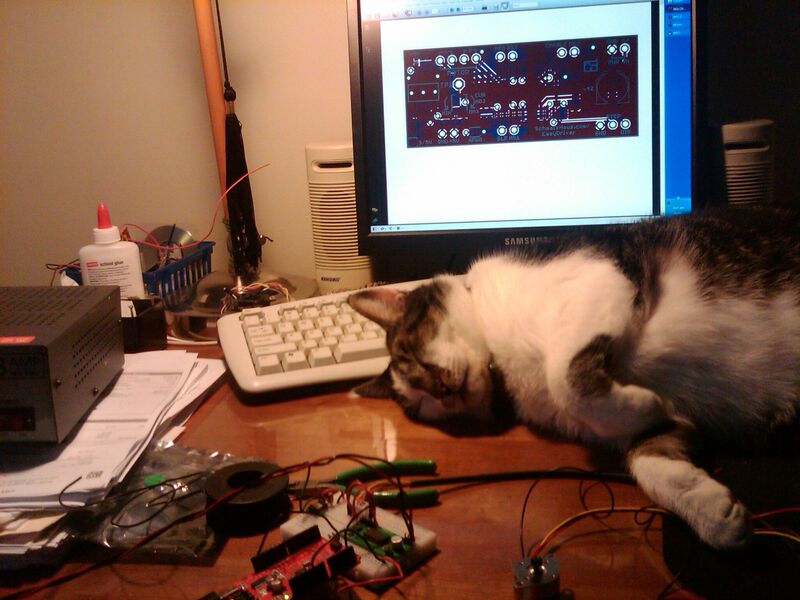 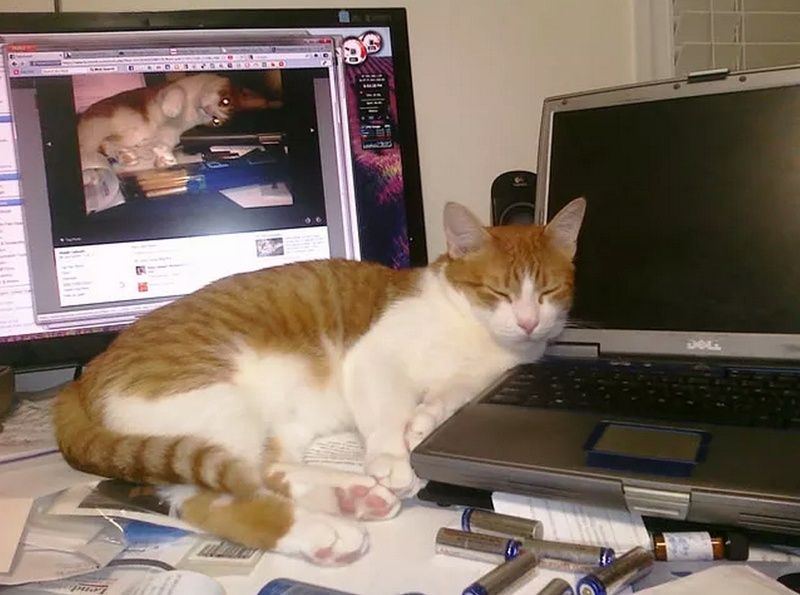 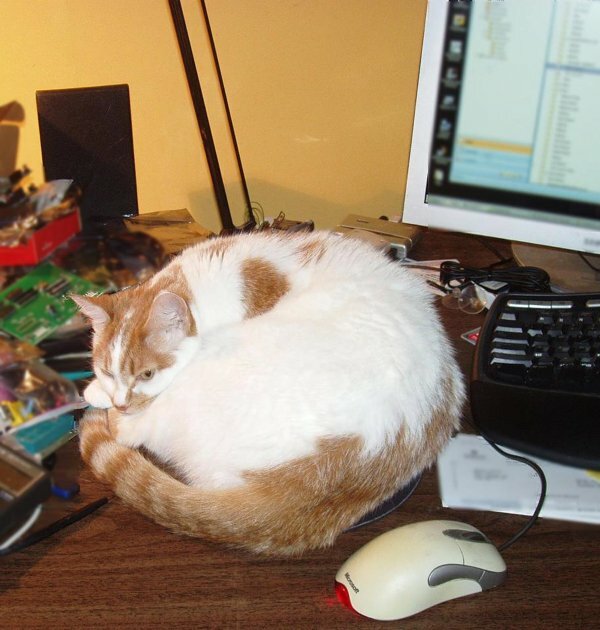 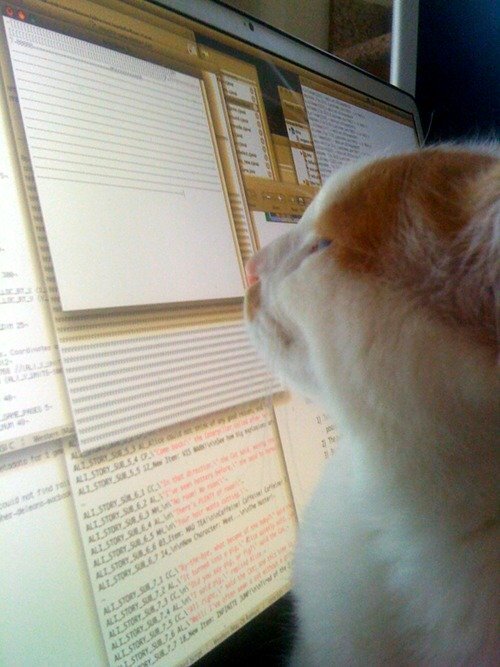 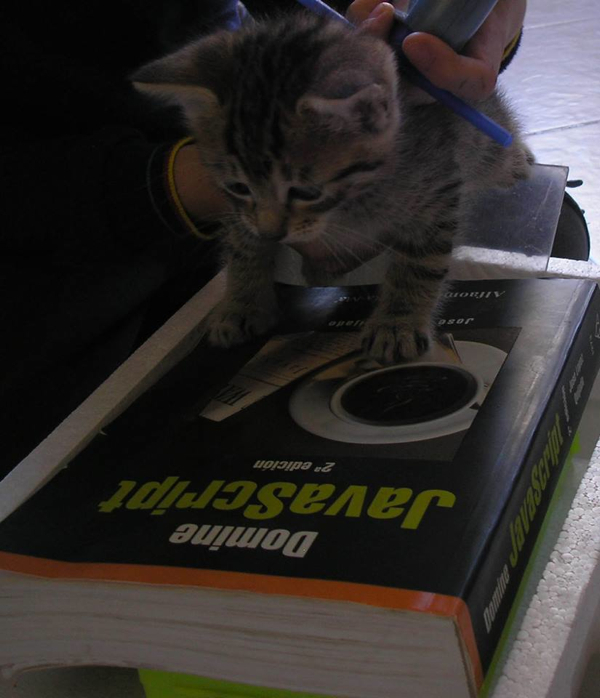 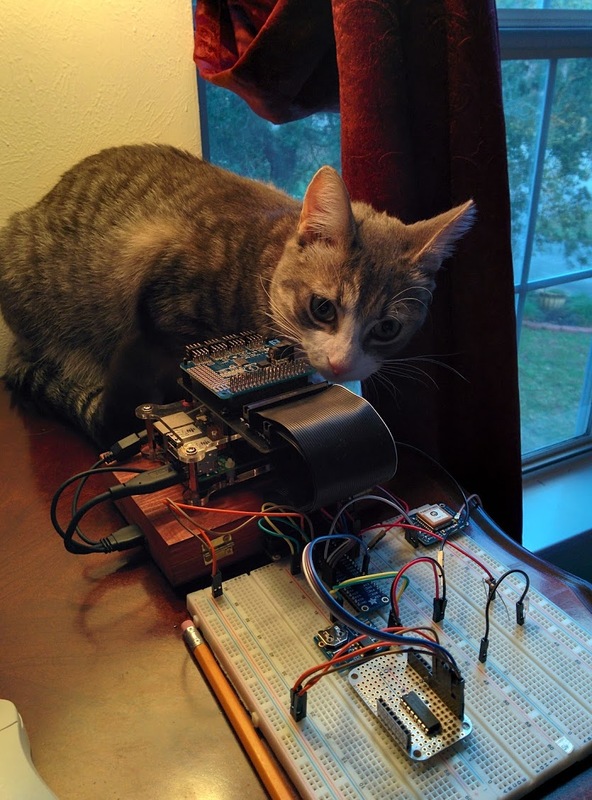 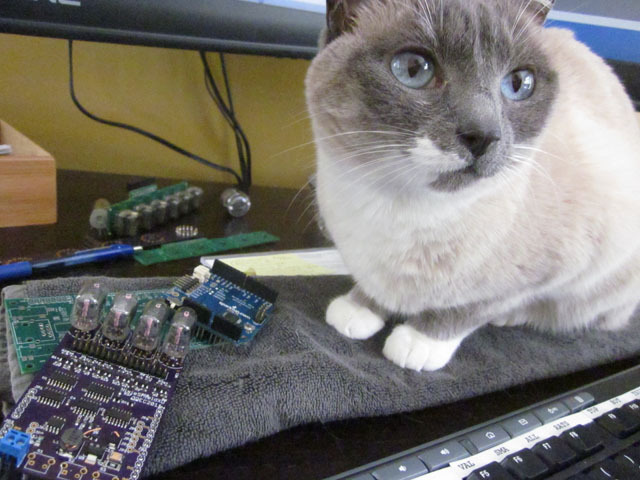 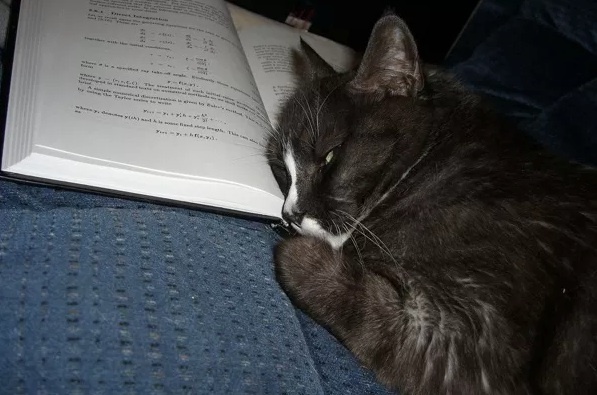 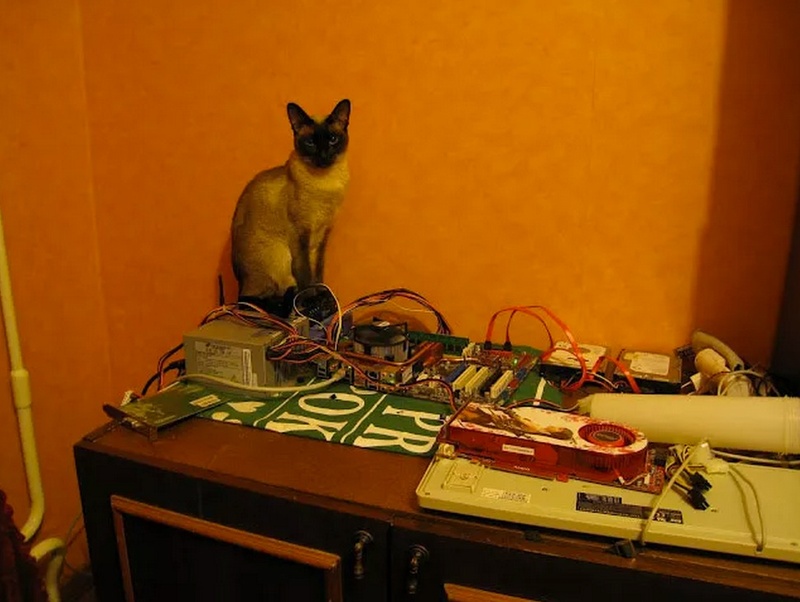 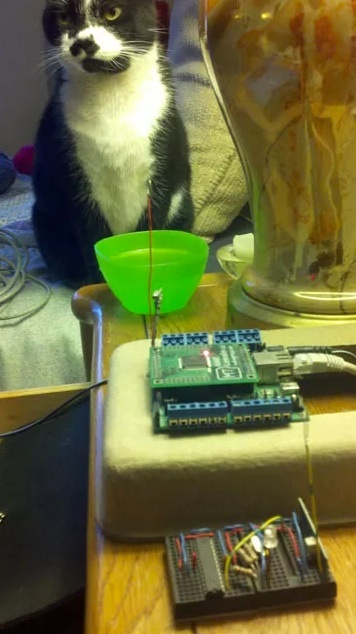 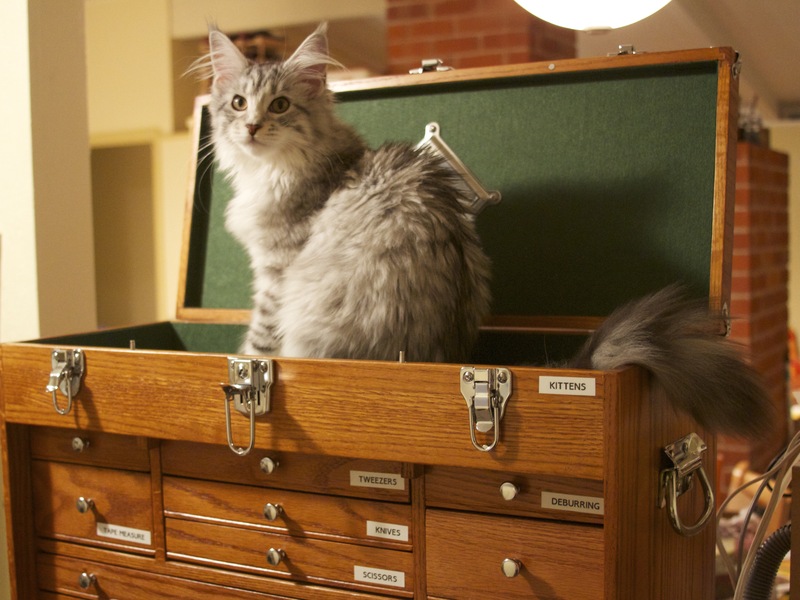 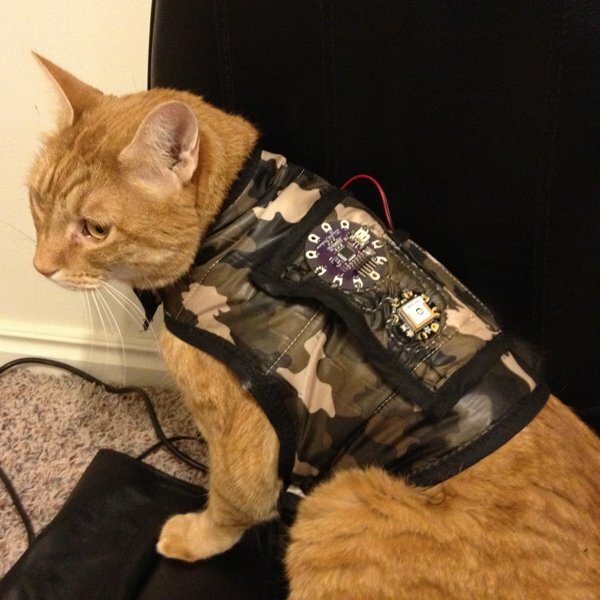 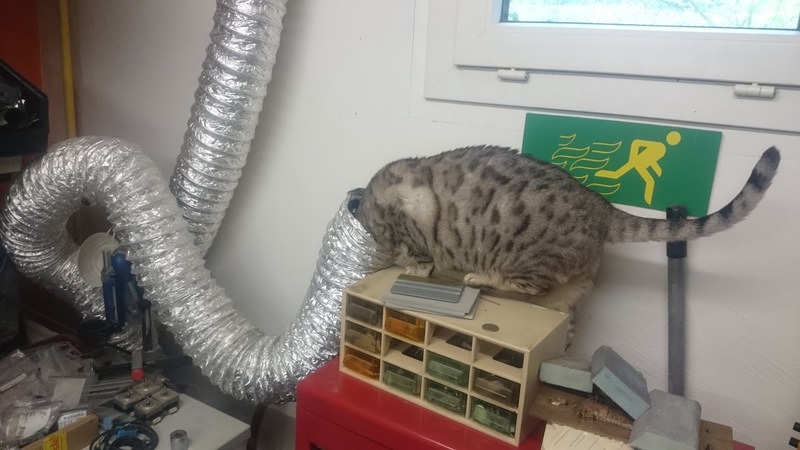 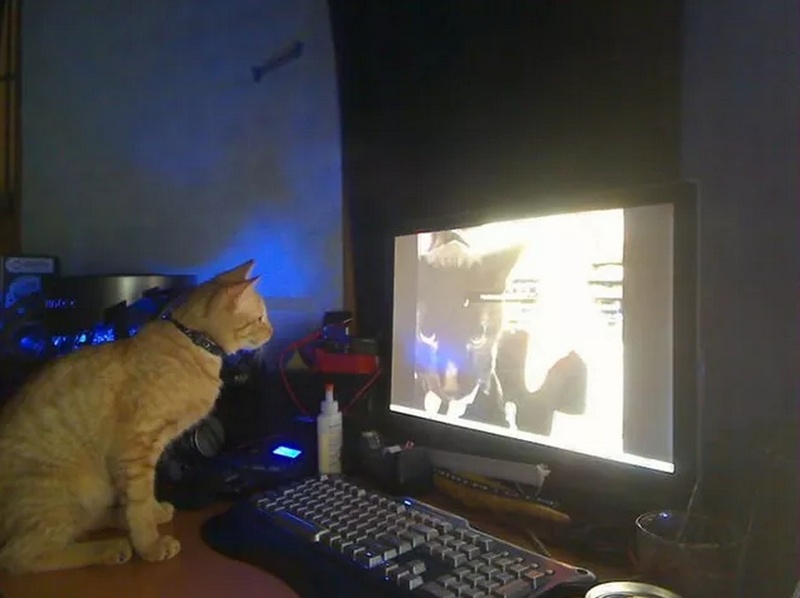 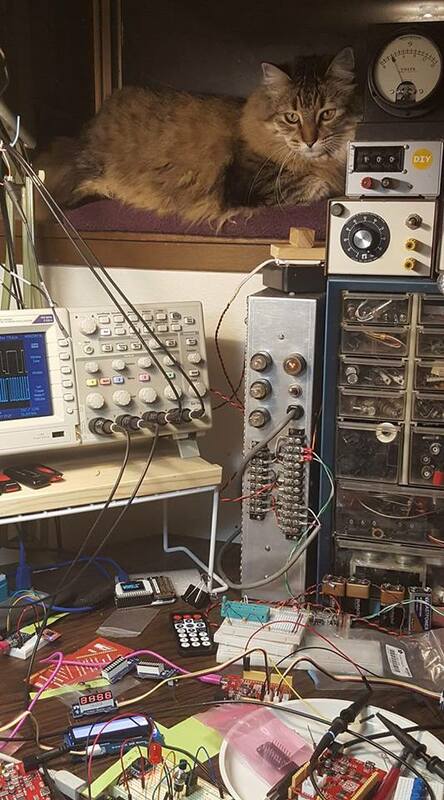 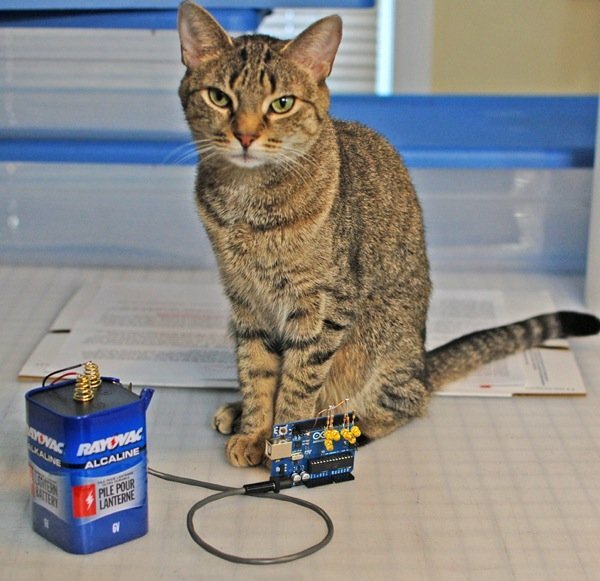 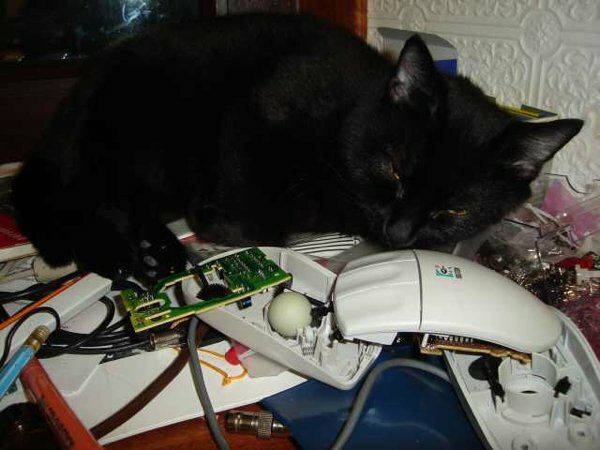 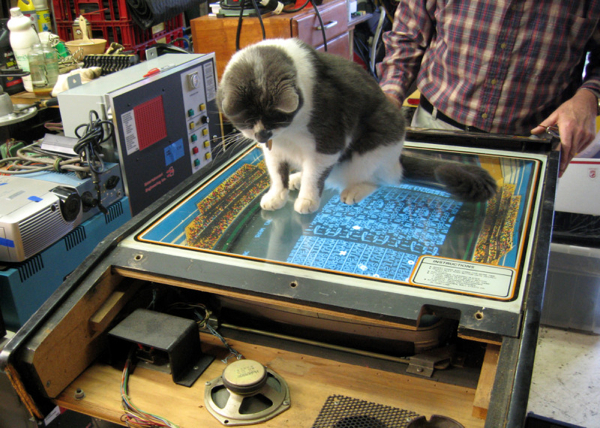 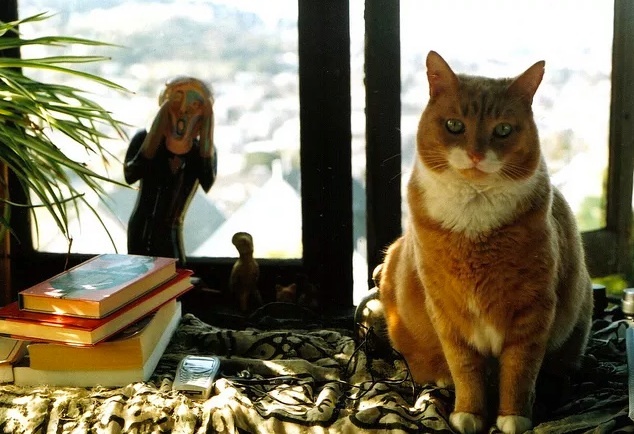 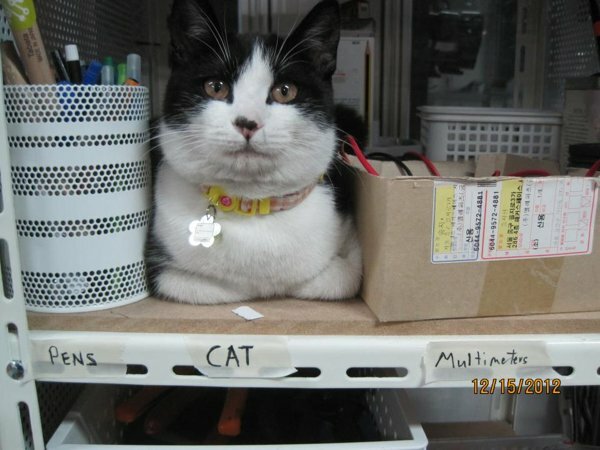 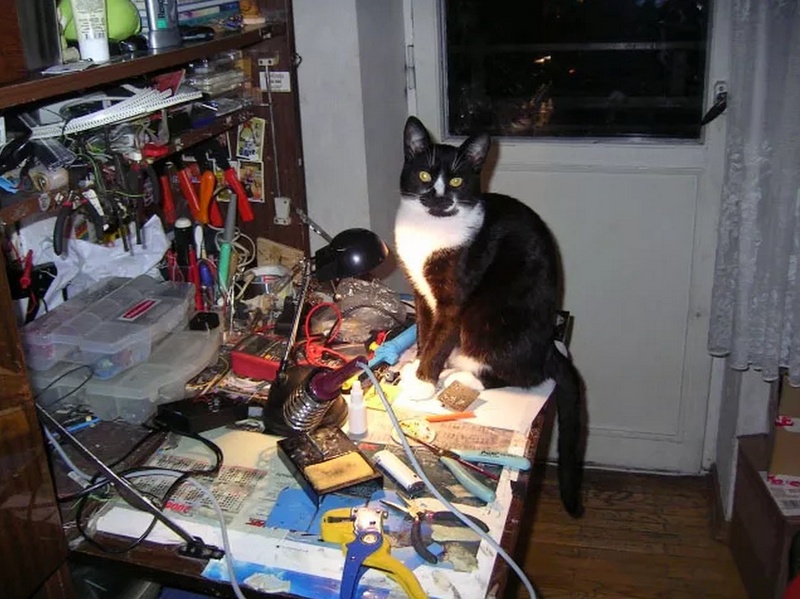 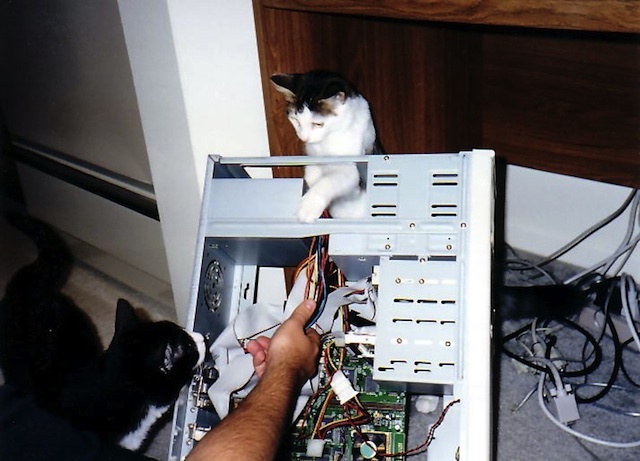 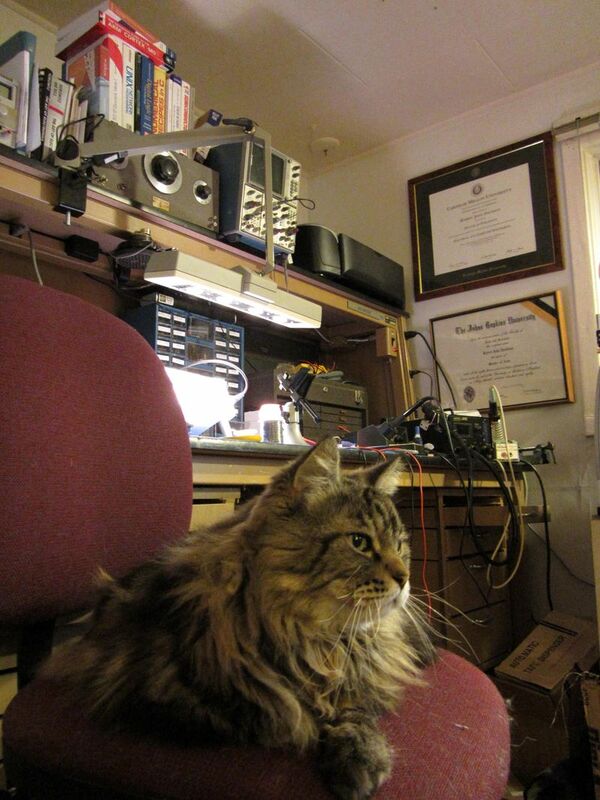 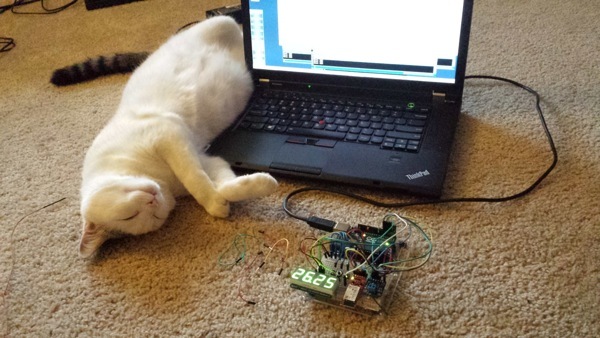 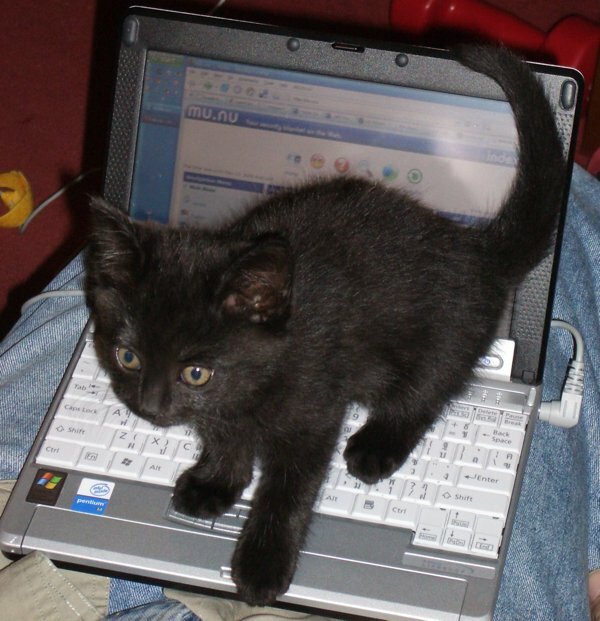 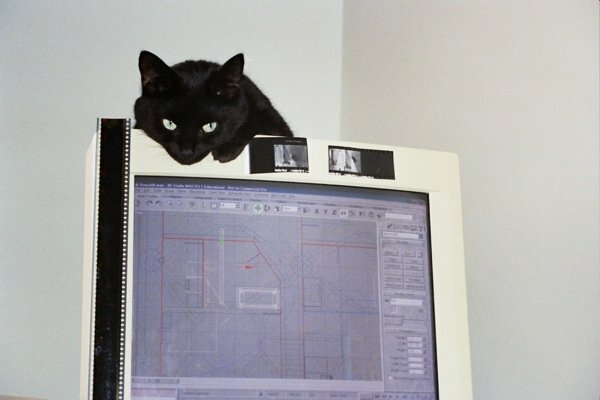 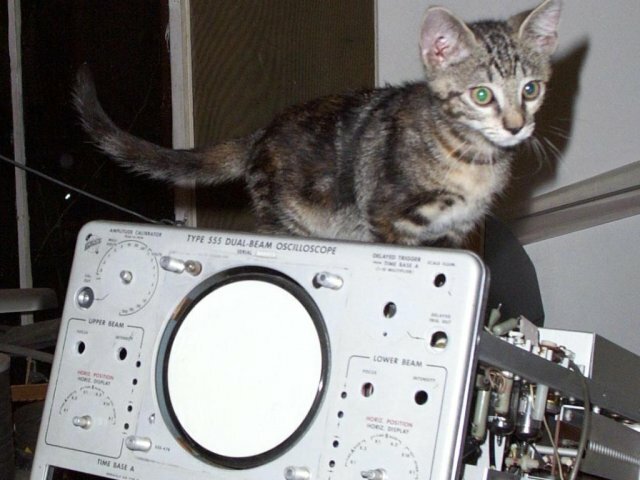 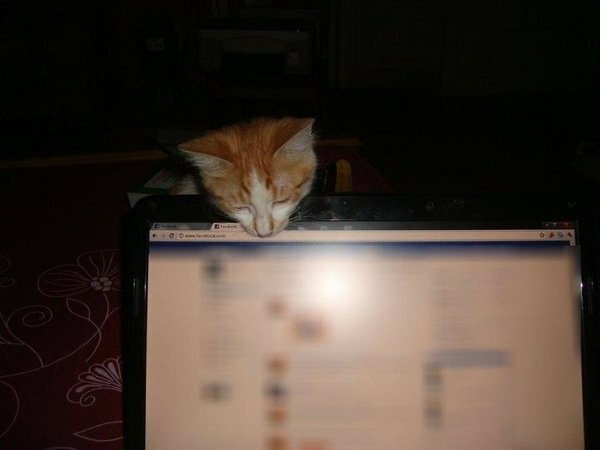 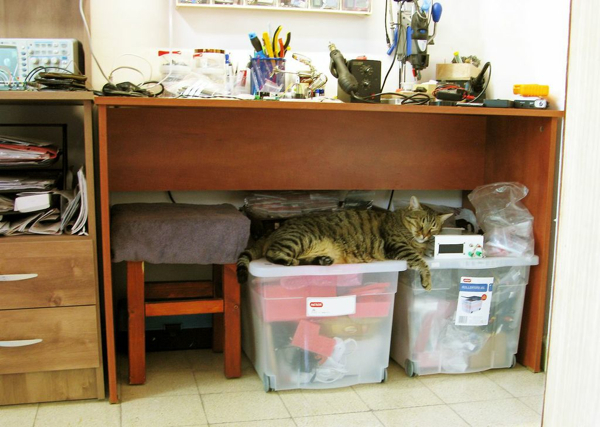 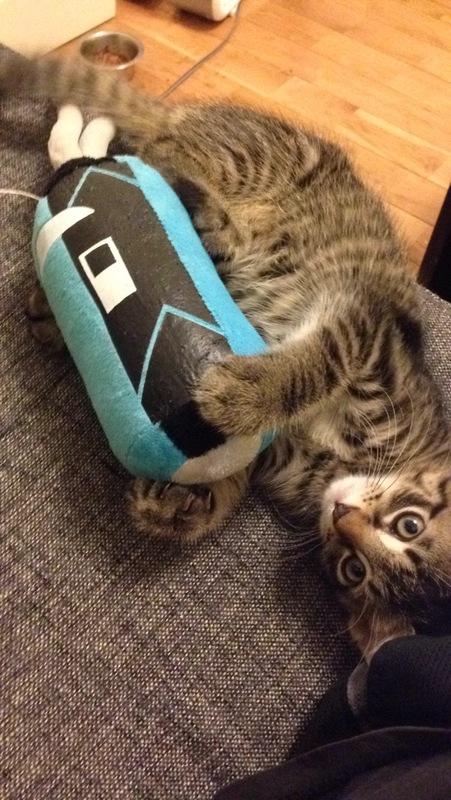 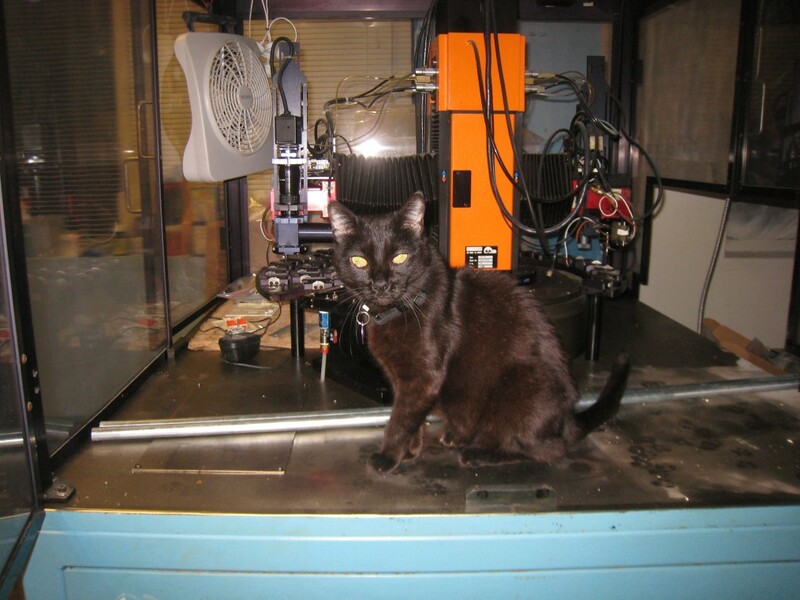 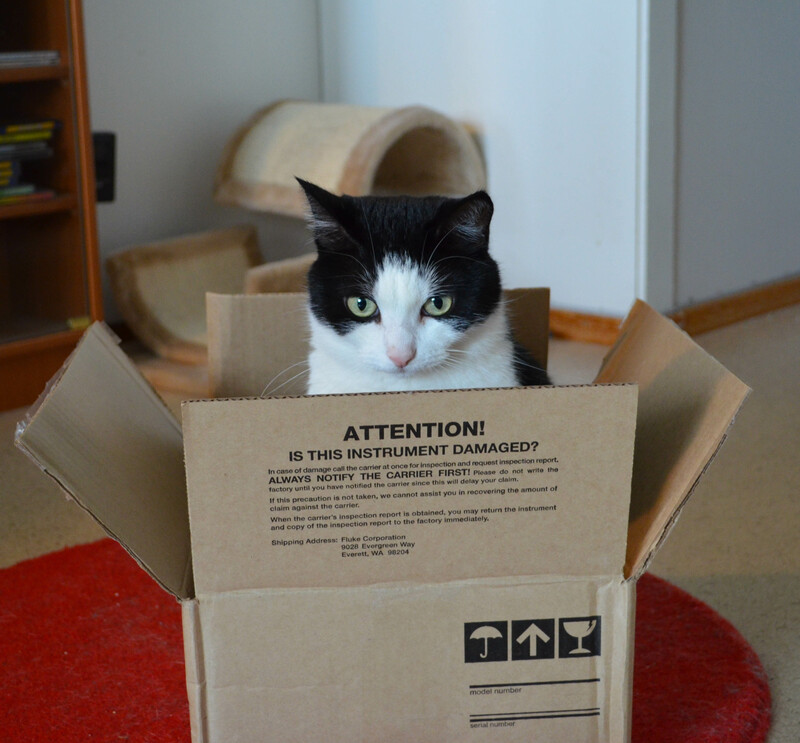 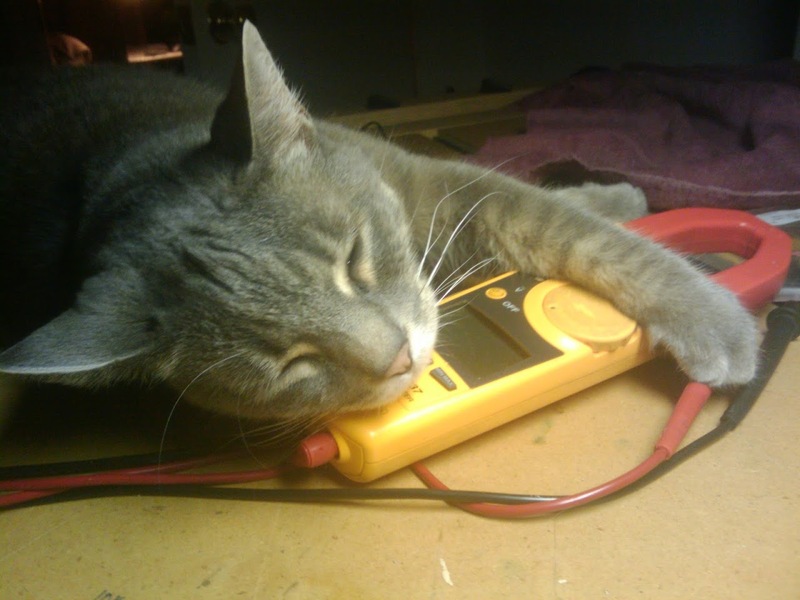 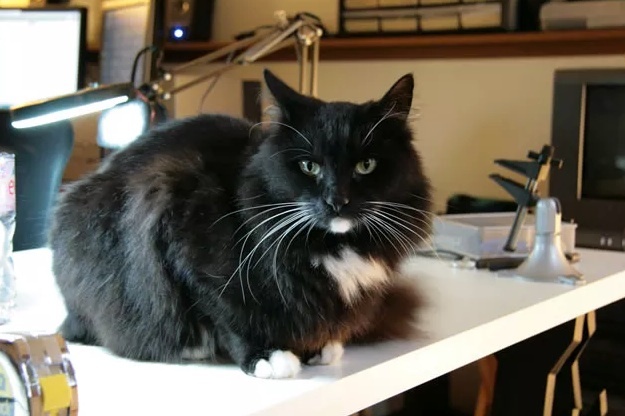 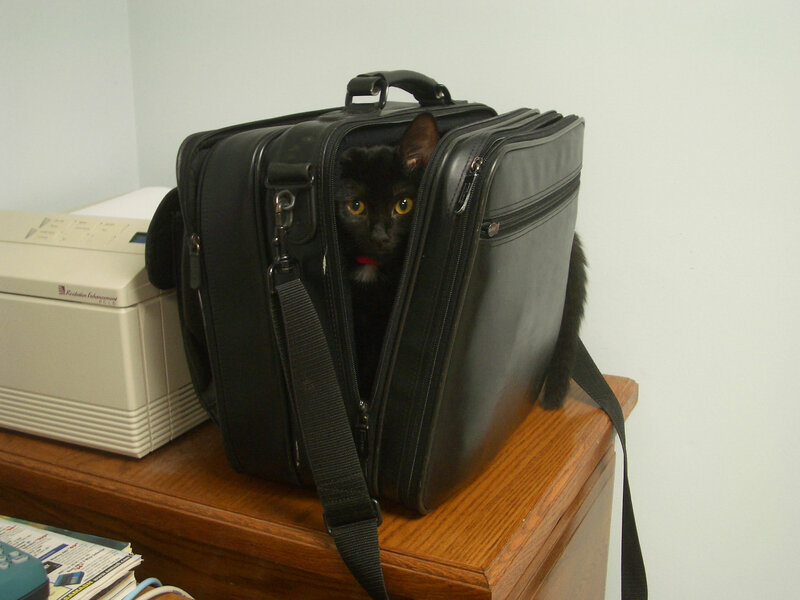 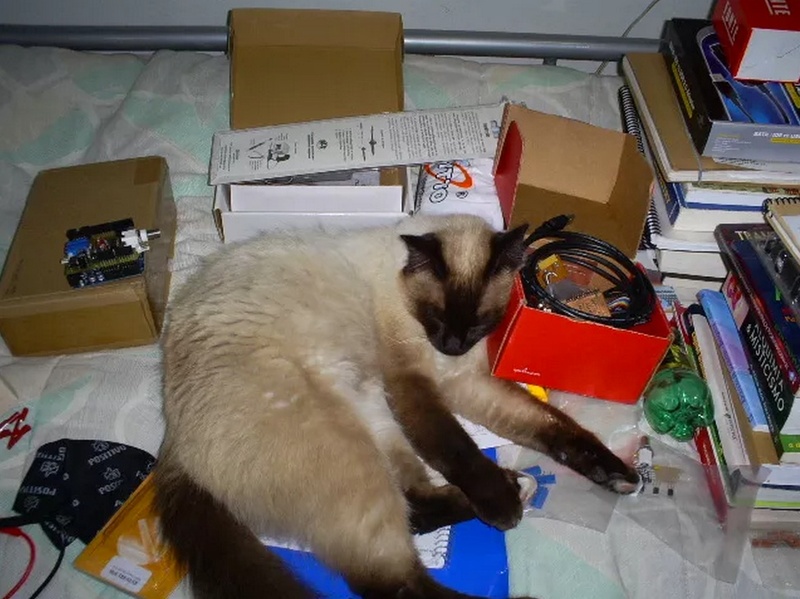 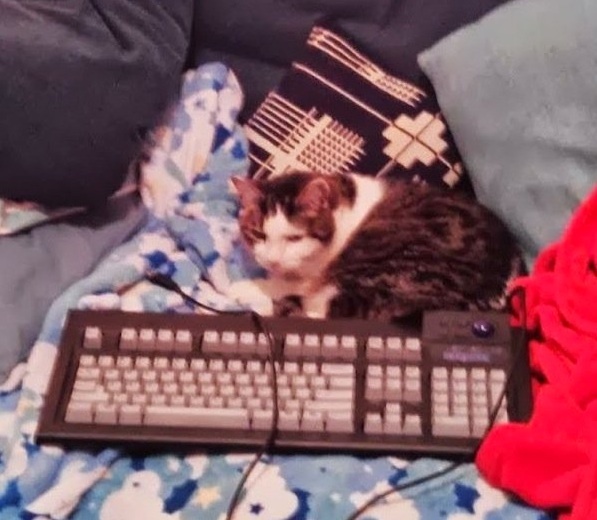 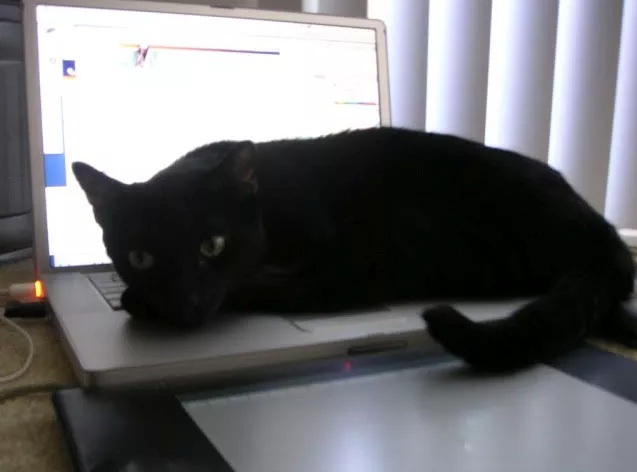 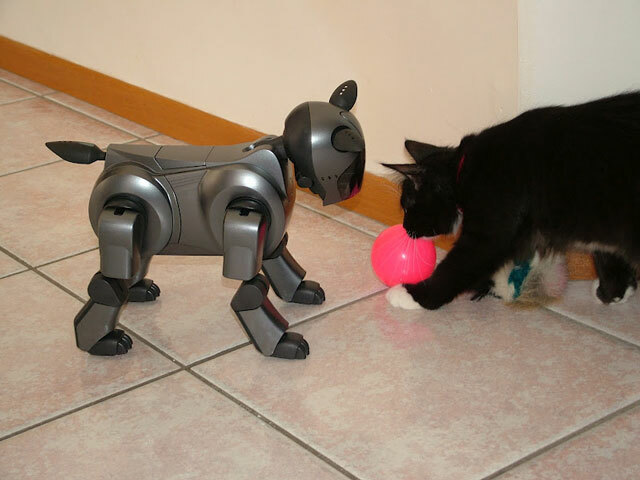 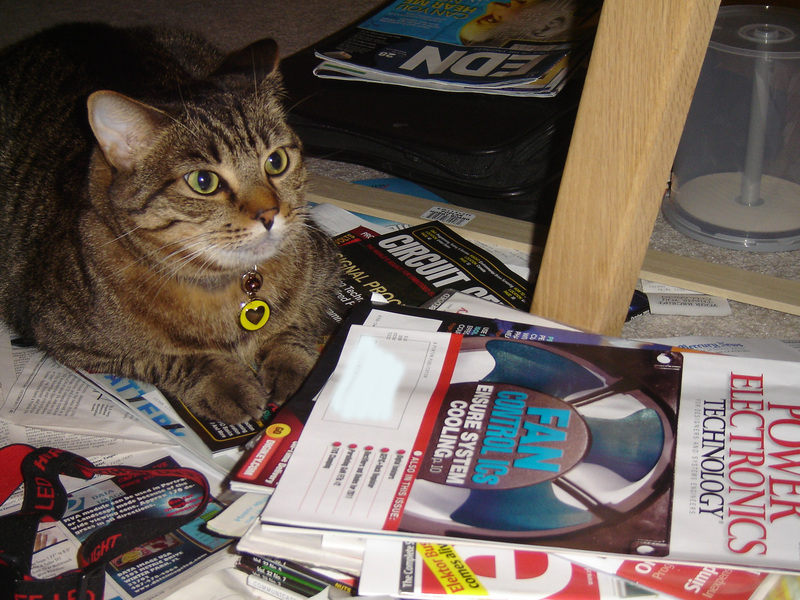 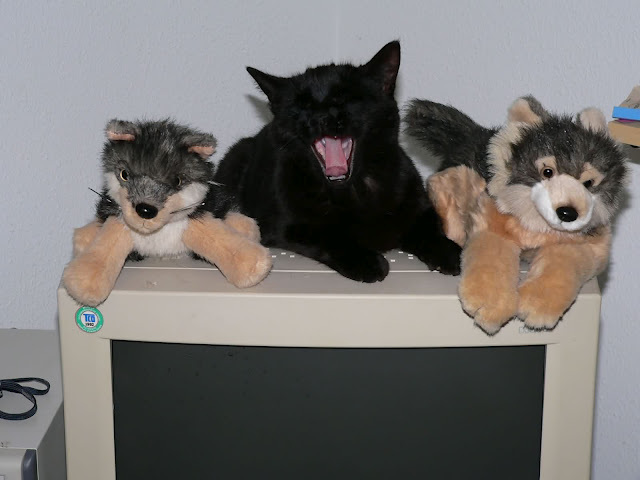 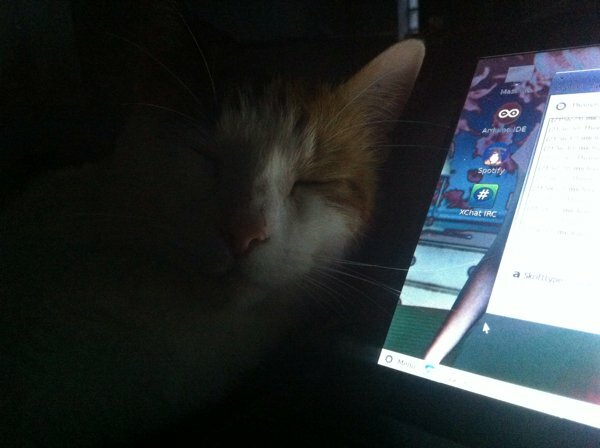 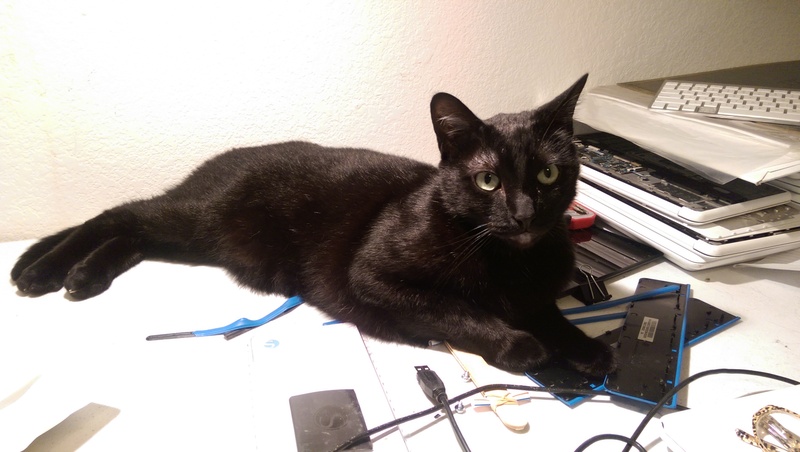 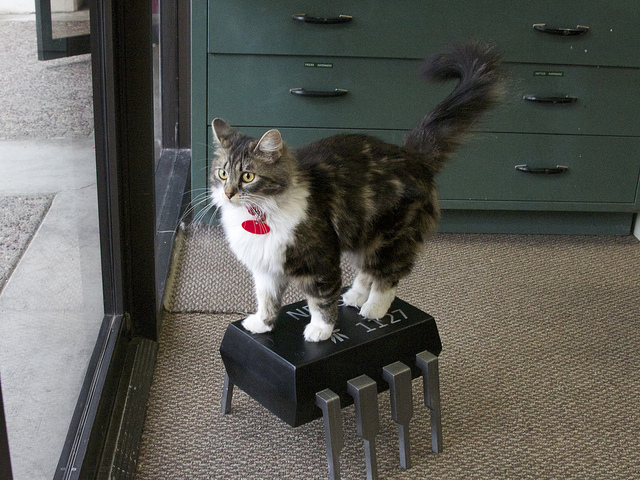 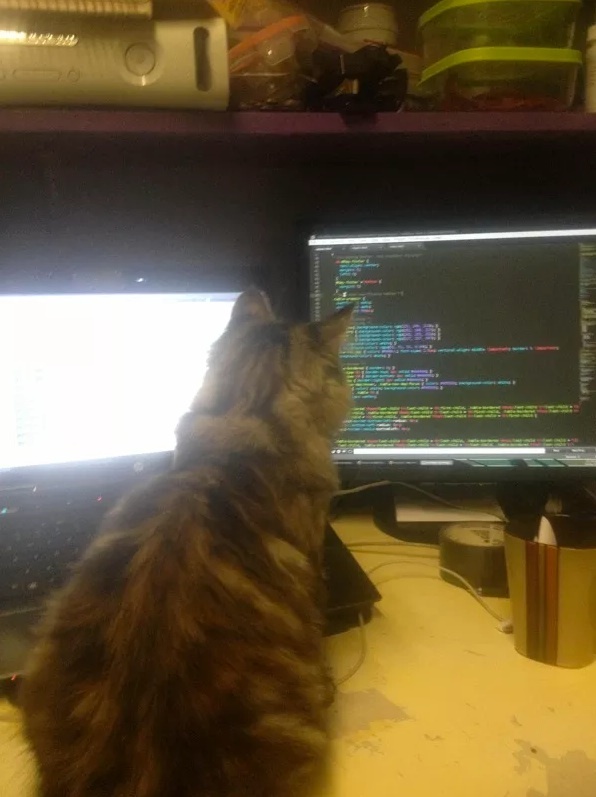 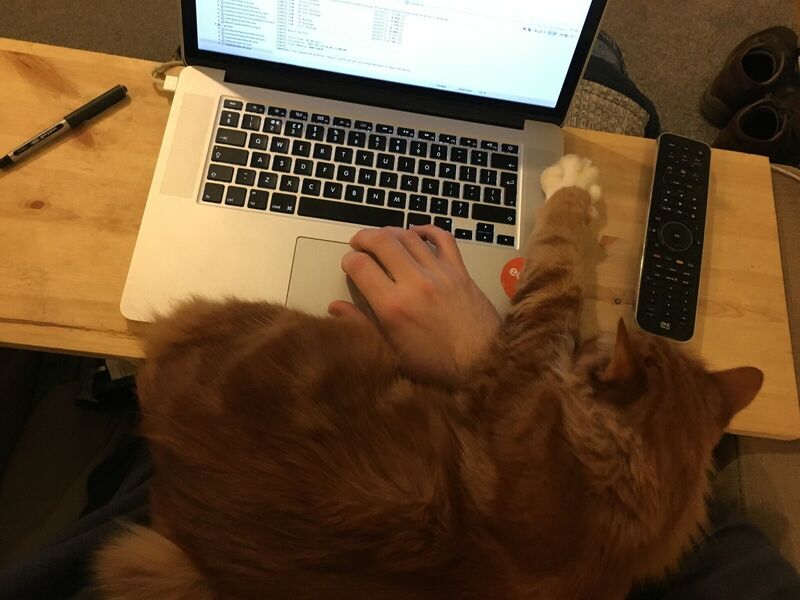 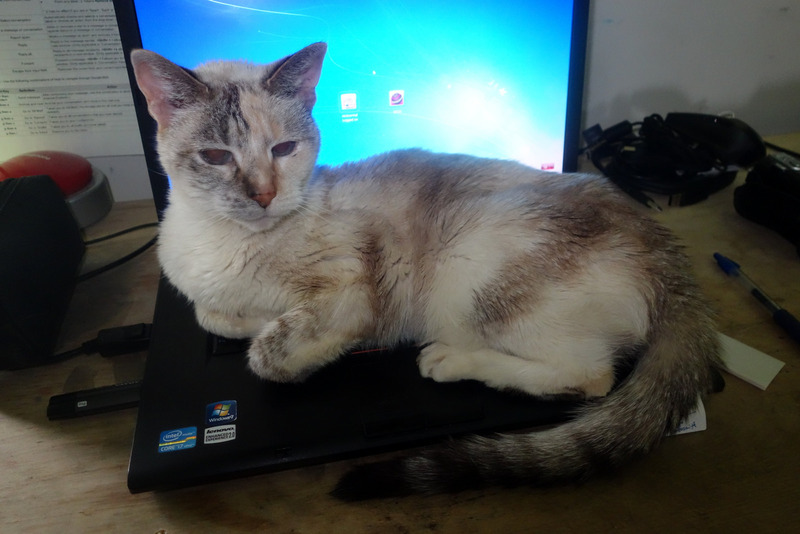 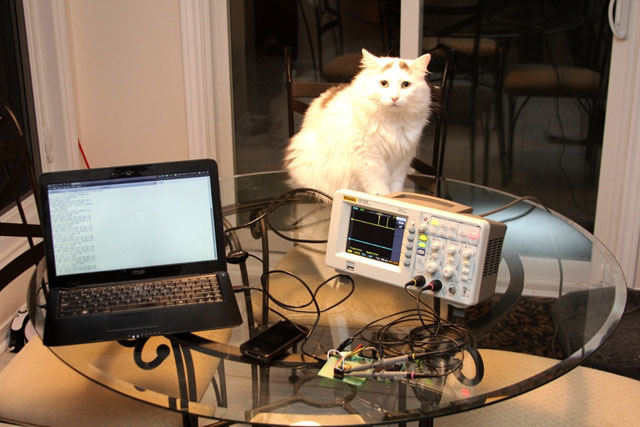 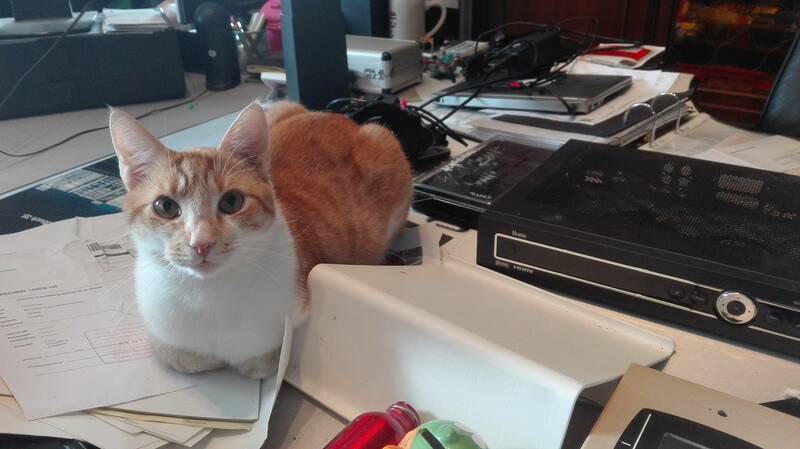 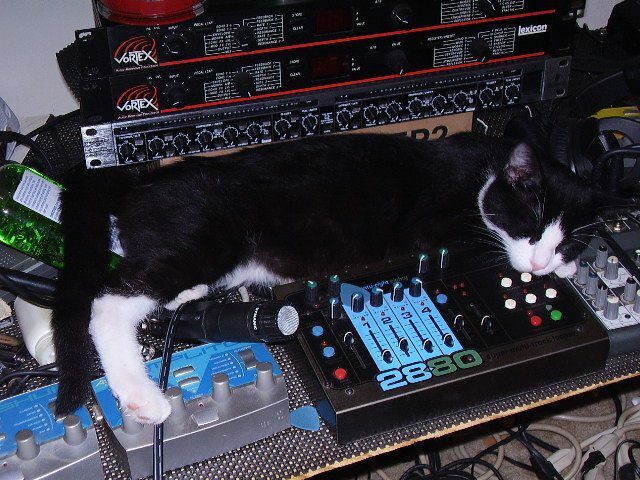 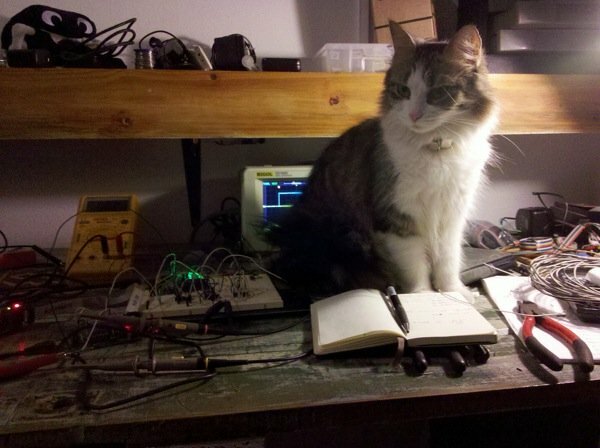 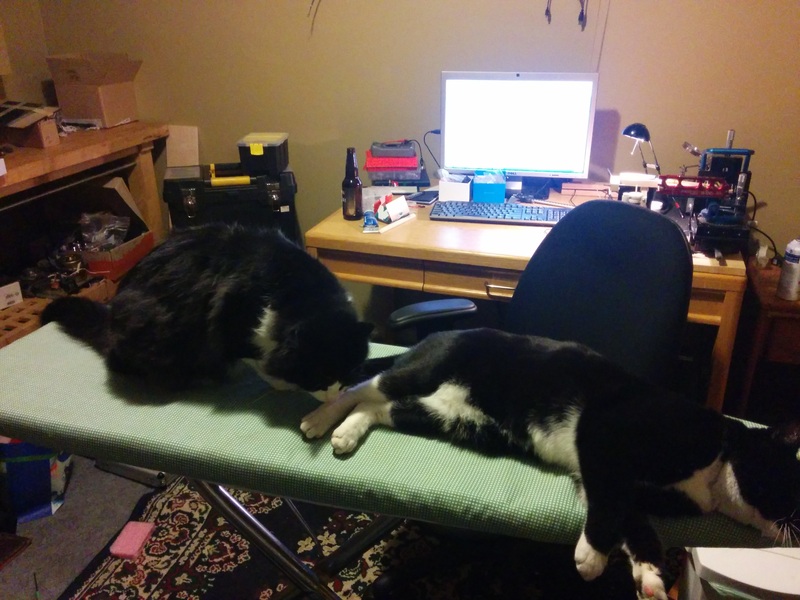 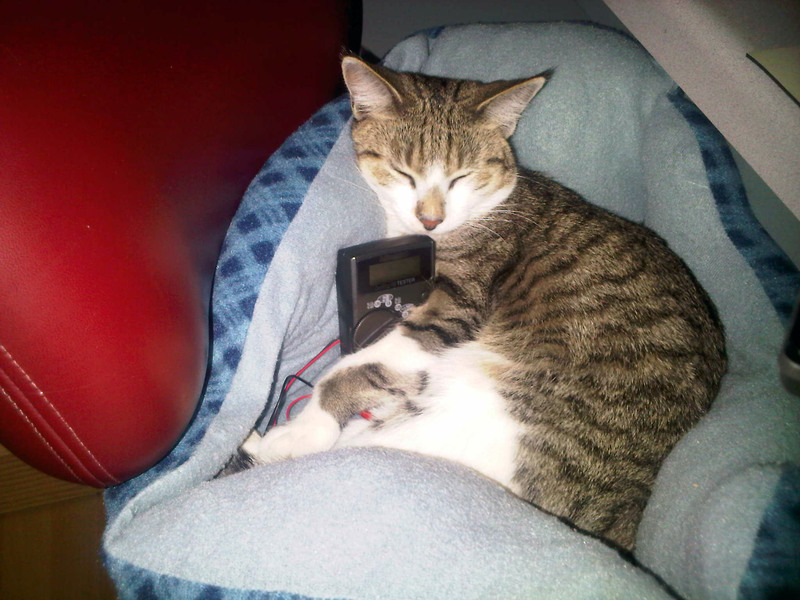 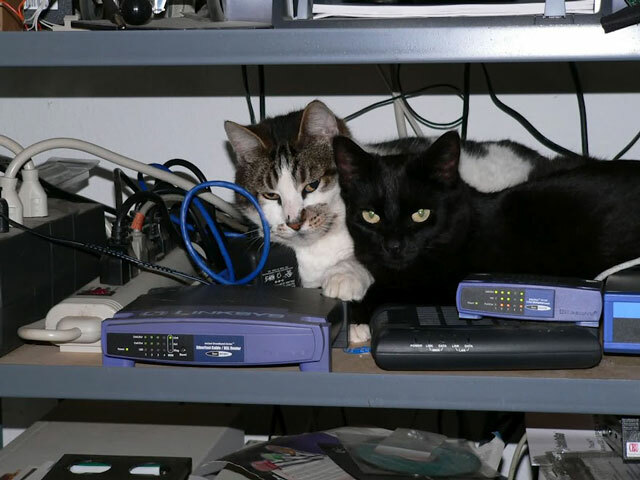 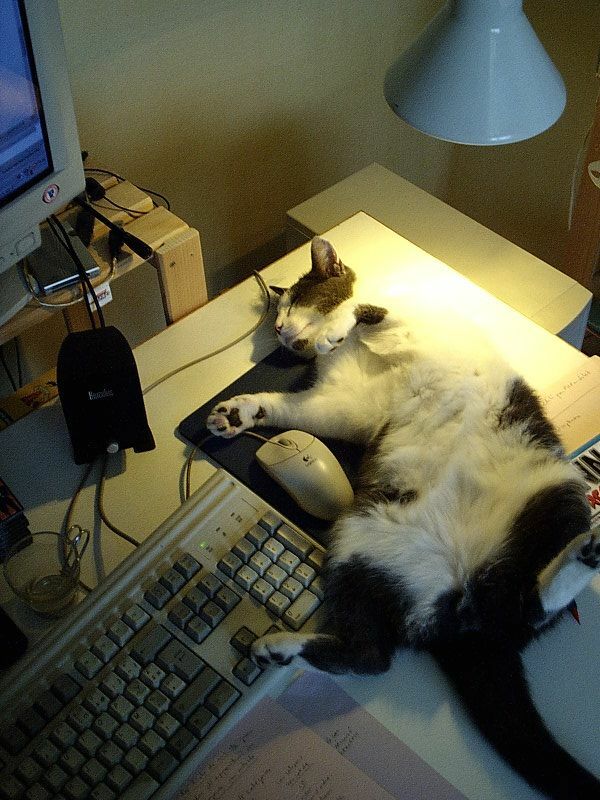 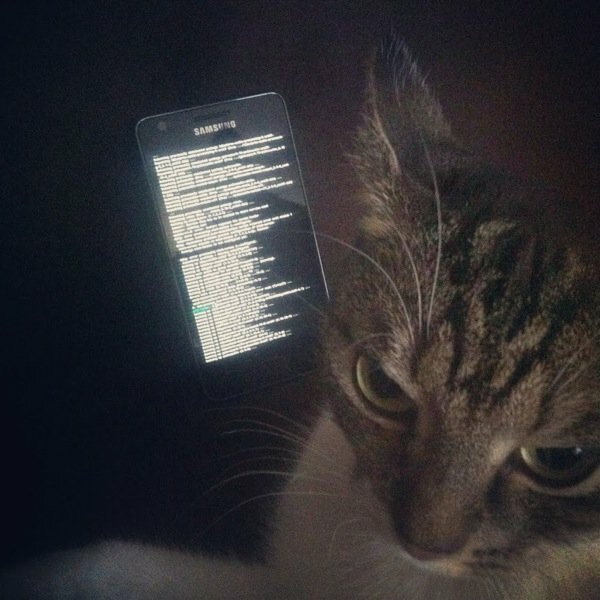 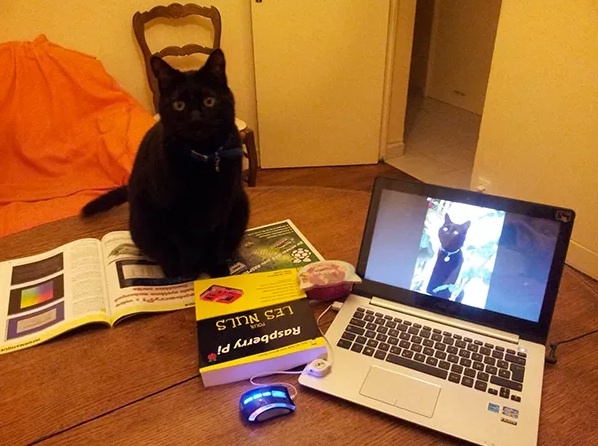 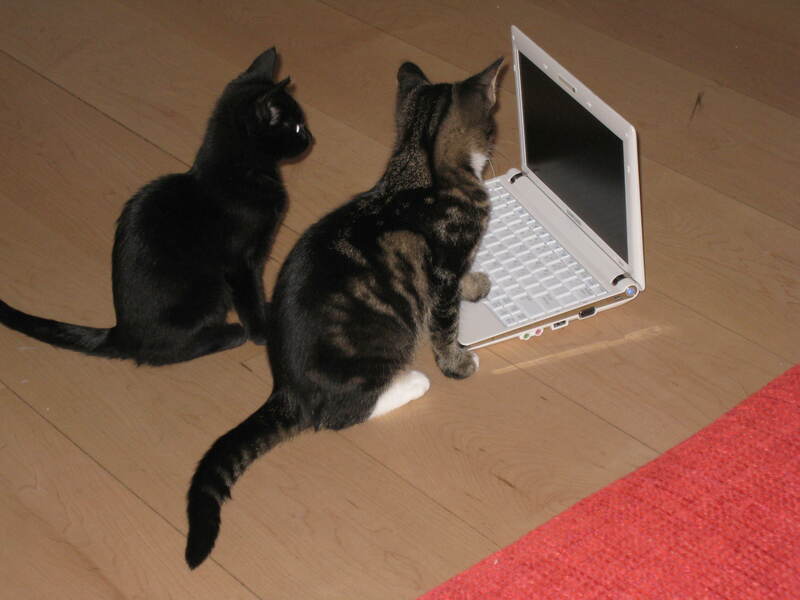 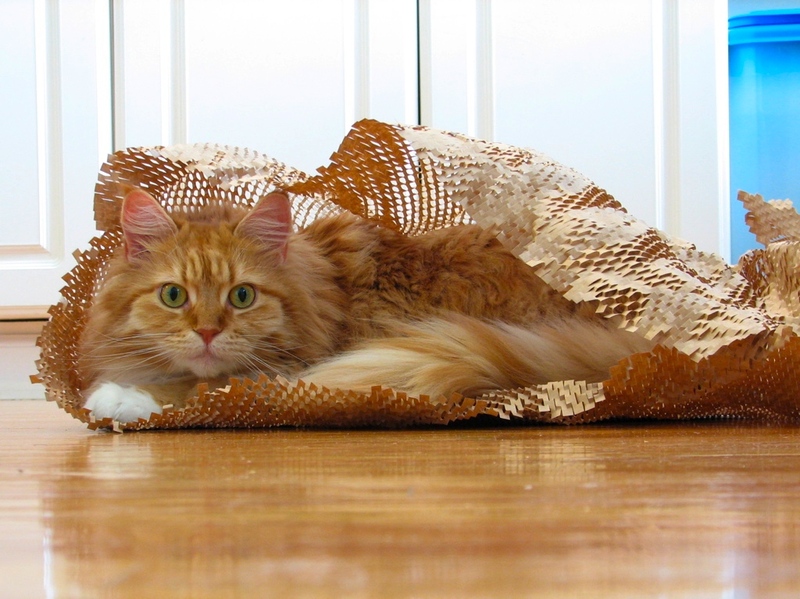 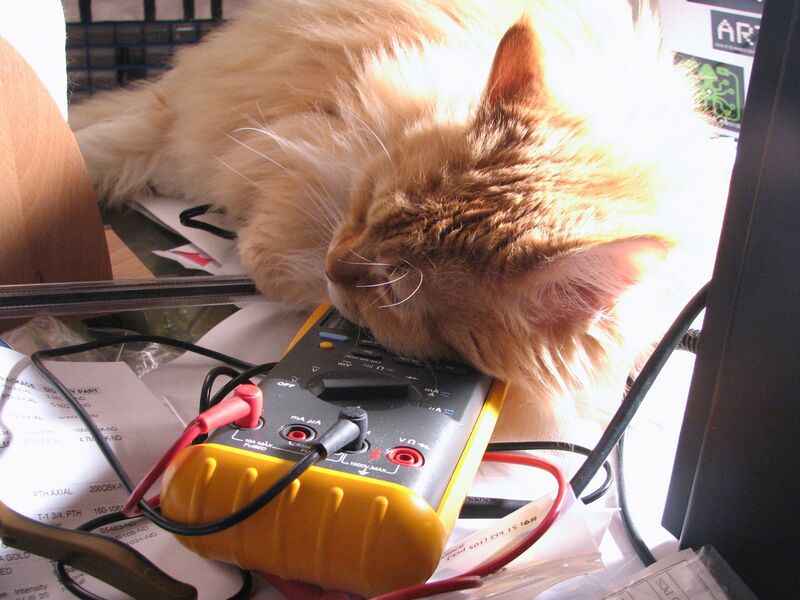 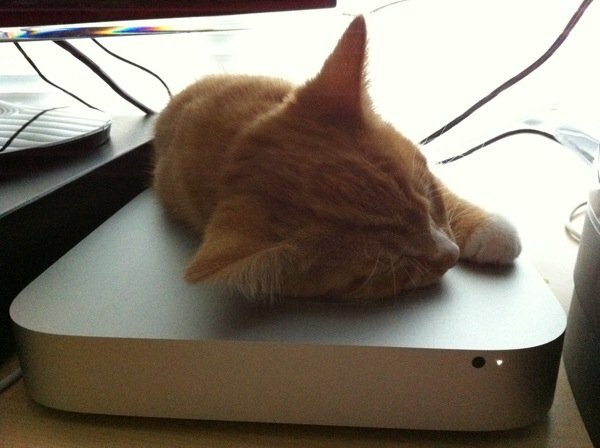 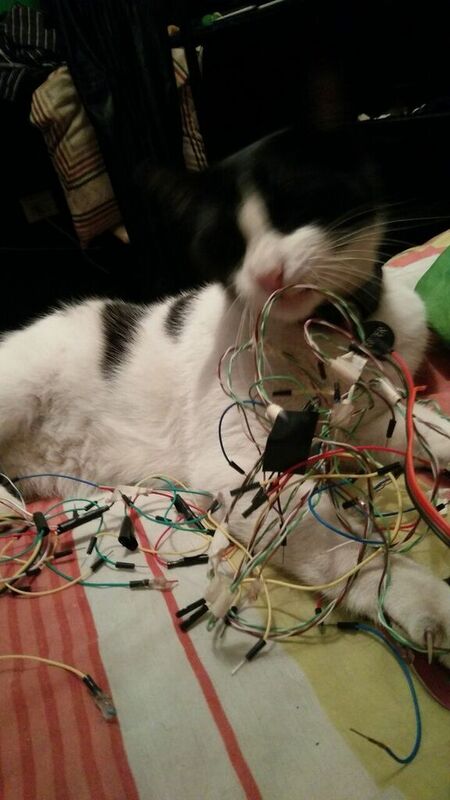 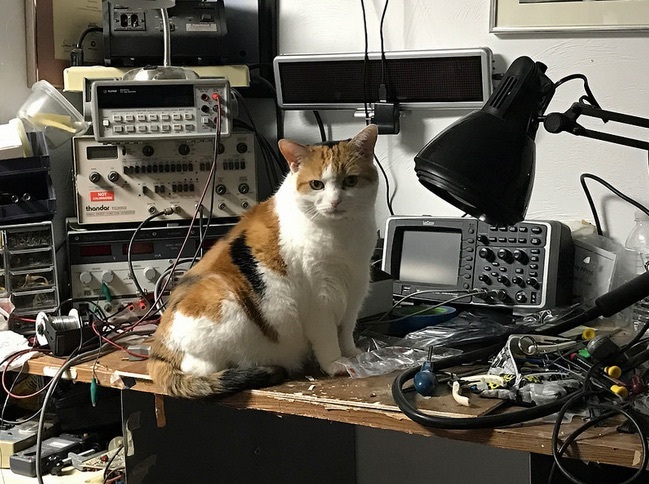 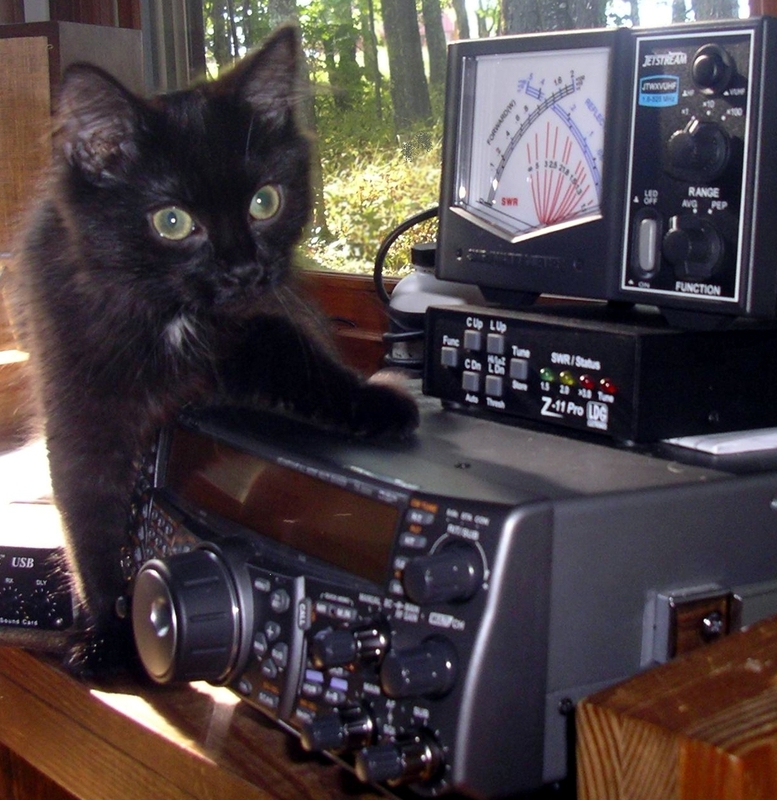 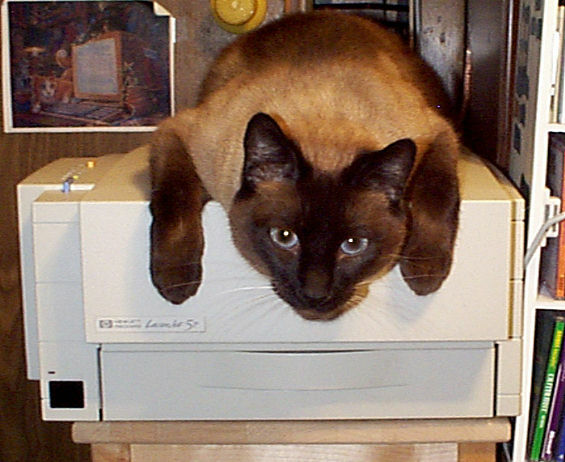 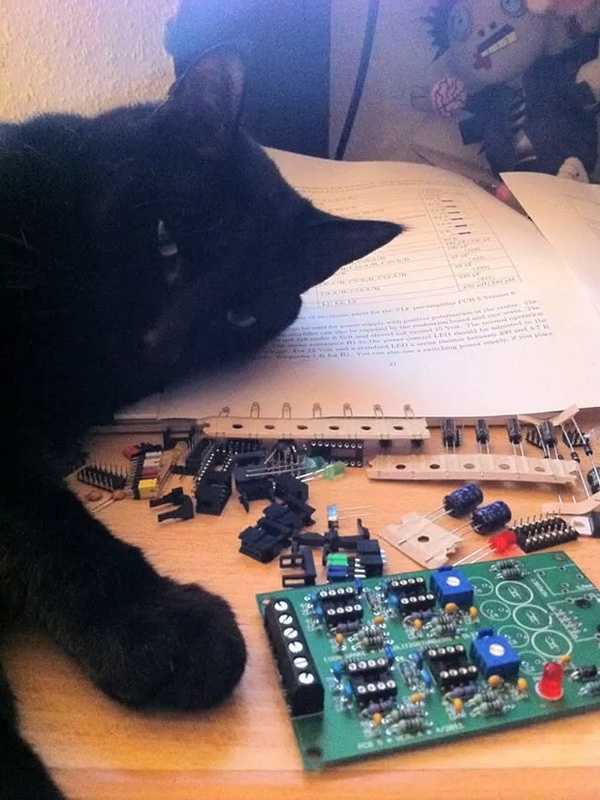 If you want to add your "cat of engineering" visit the "submit a cat" page - CLICK HERE! 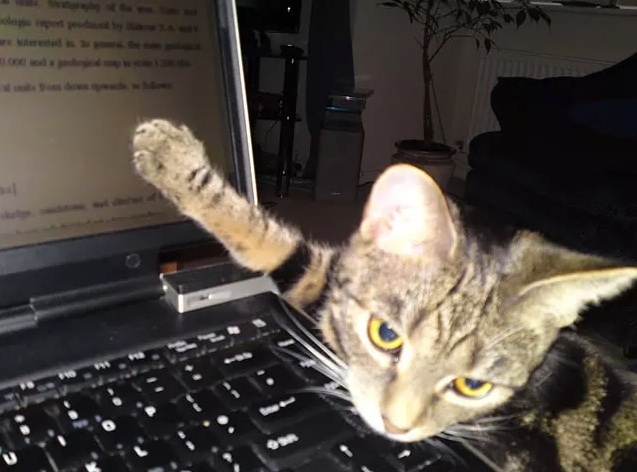 Title: Hey, quit playing with those beesss! 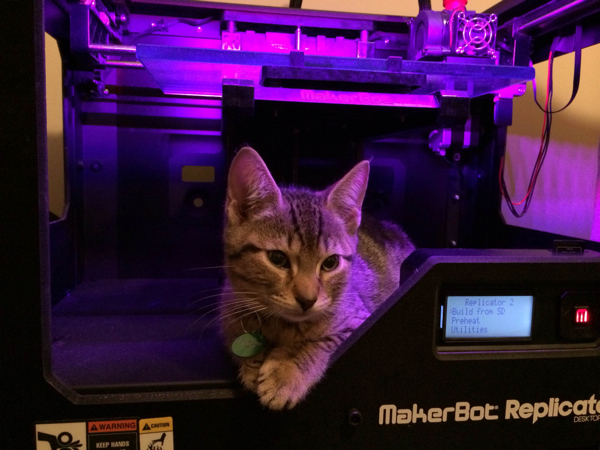 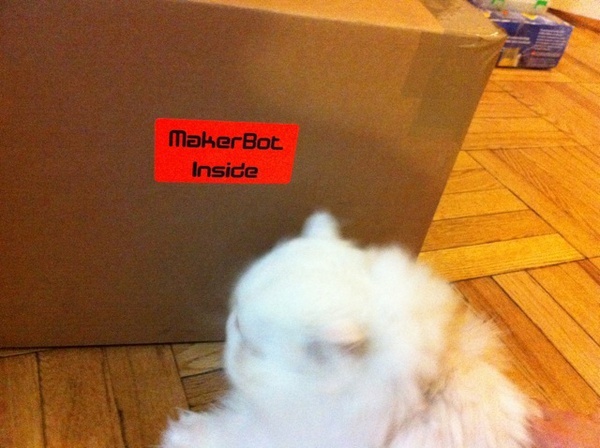 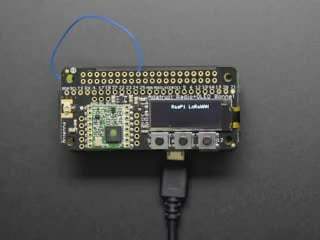 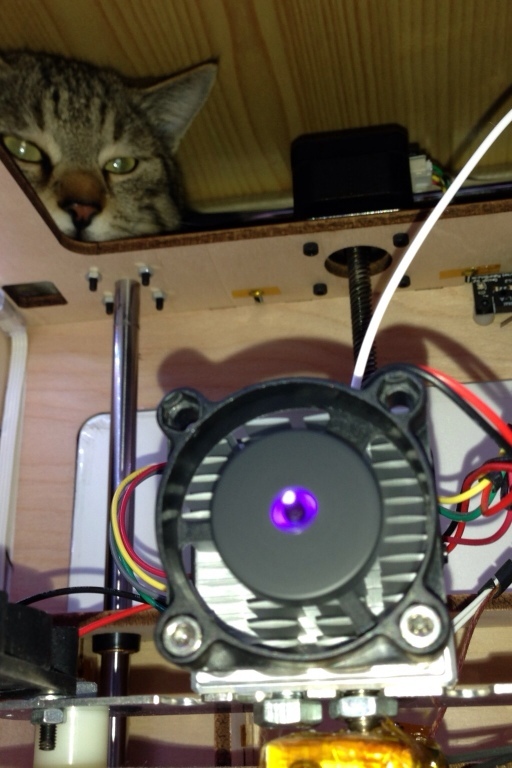 Title: The new webcam included on the makerbot? 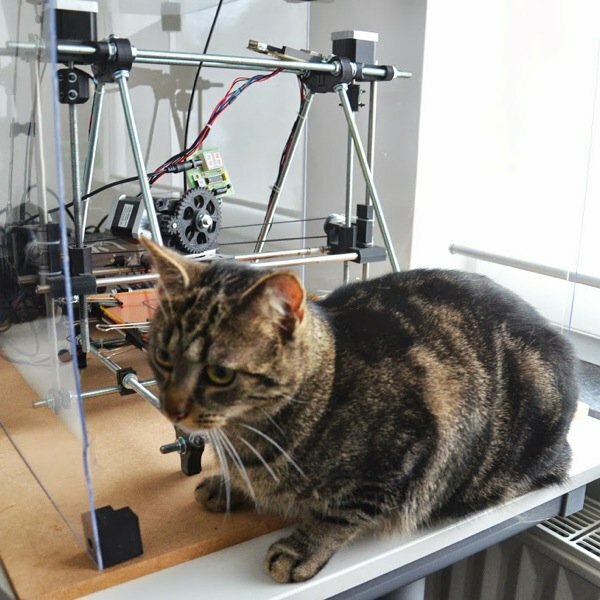 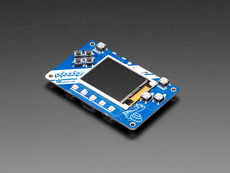 We have a webcat, much better resolution and feedback!! 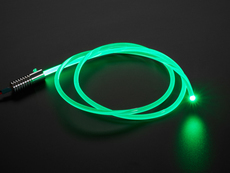 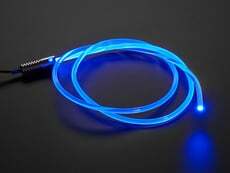 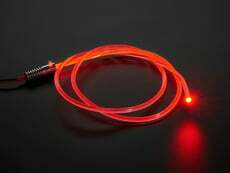 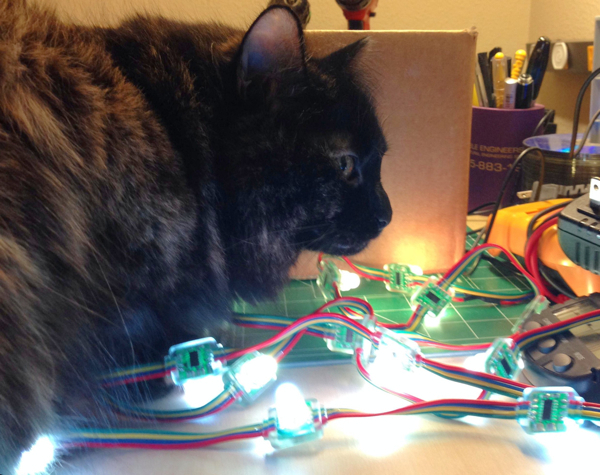 Title: Carmen enjoying the 12mm diffused LED pixel strand. 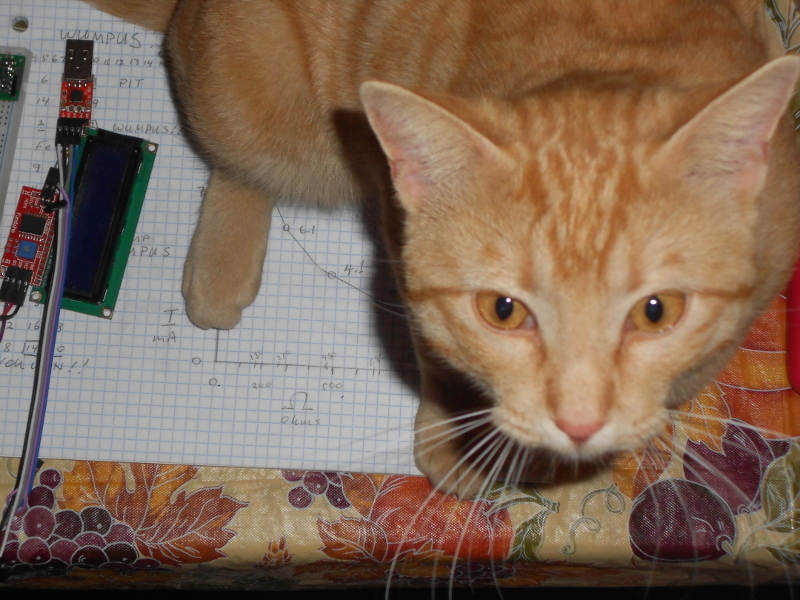 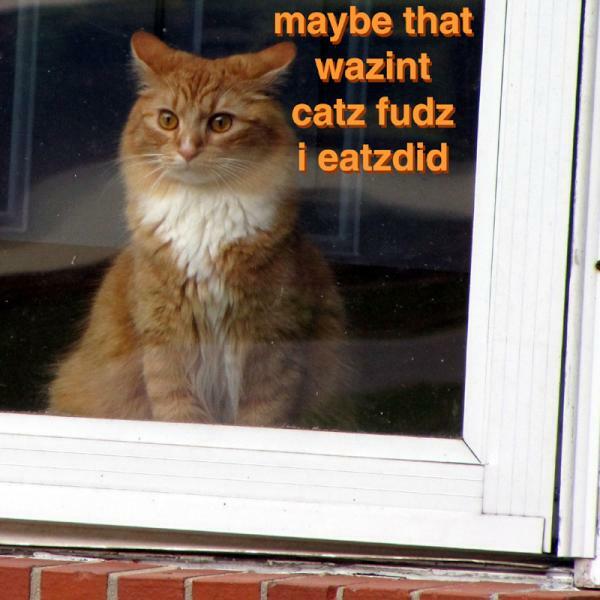 Title: One day Schrödinger will ask about where he came from. 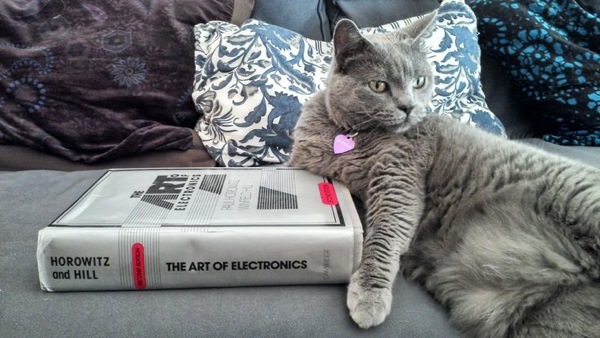 I don't look forward to explaining it. 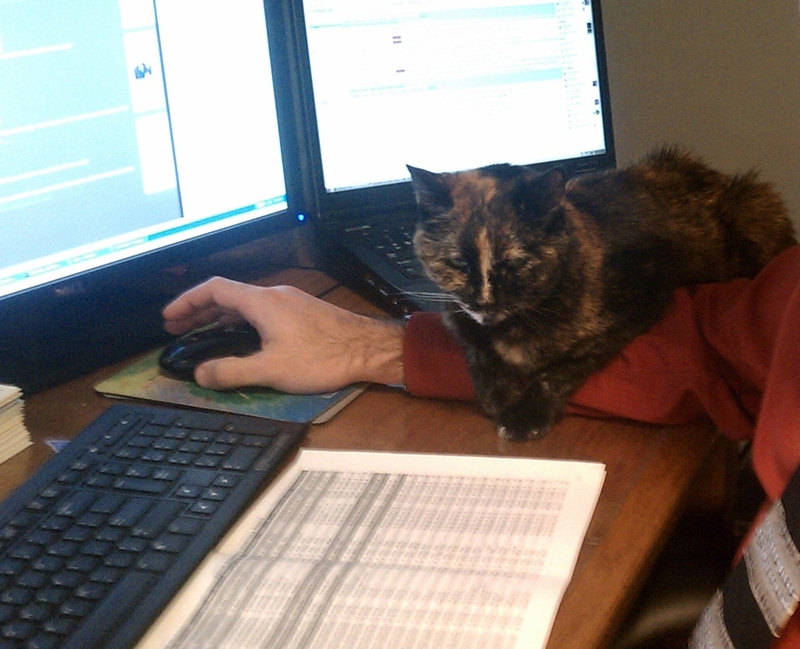 Title: Lila likes to help.. 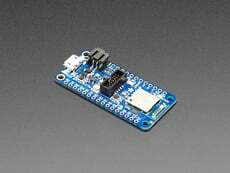 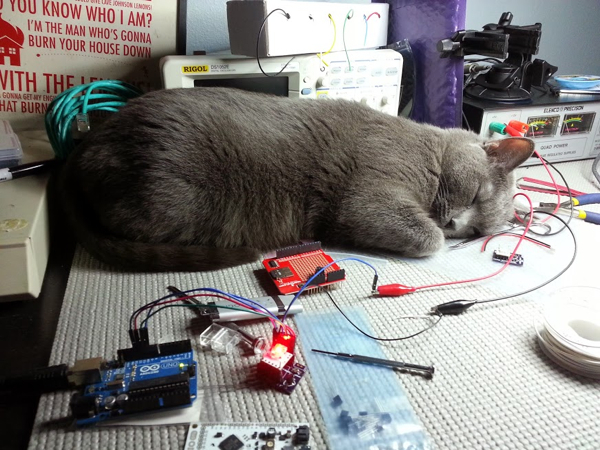 Title: Soldering at night, sleeping at day. 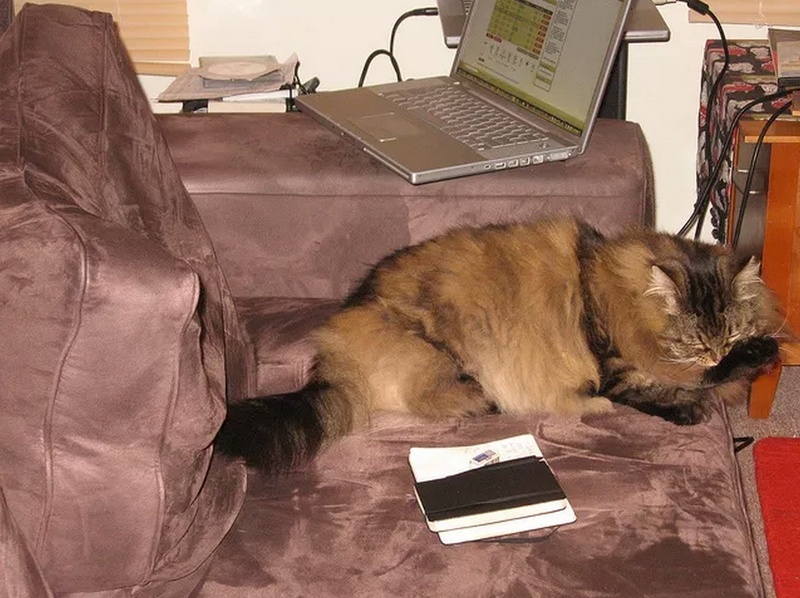 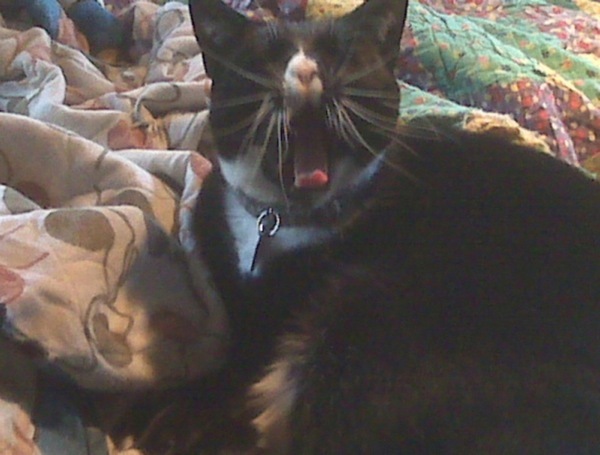 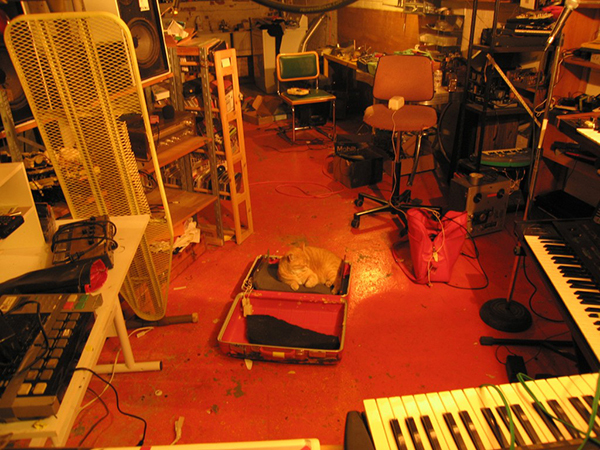 Title: "Discrete Integration" or "Discrete Napping?" 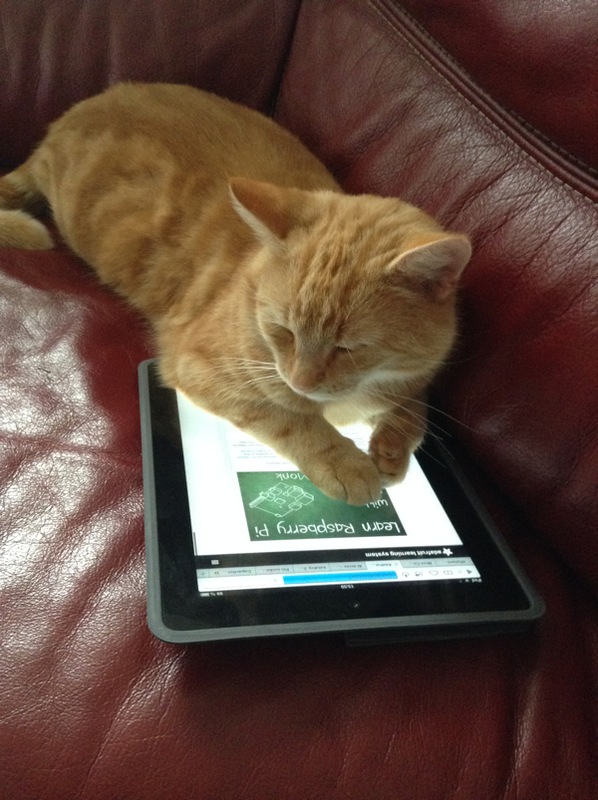 Title: This is MY iBook! 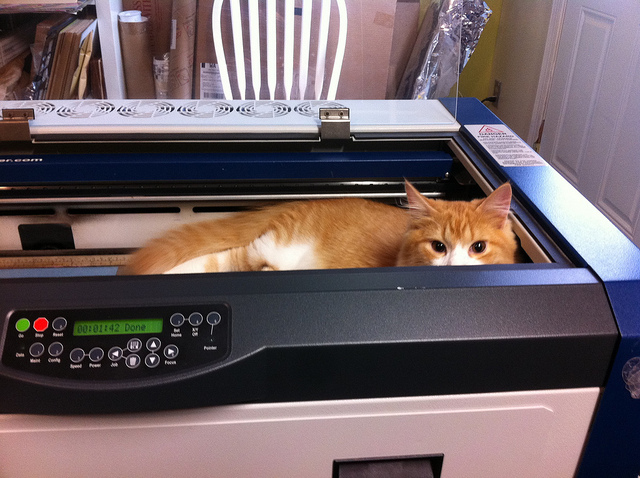 Title: Oh... you want to print something? 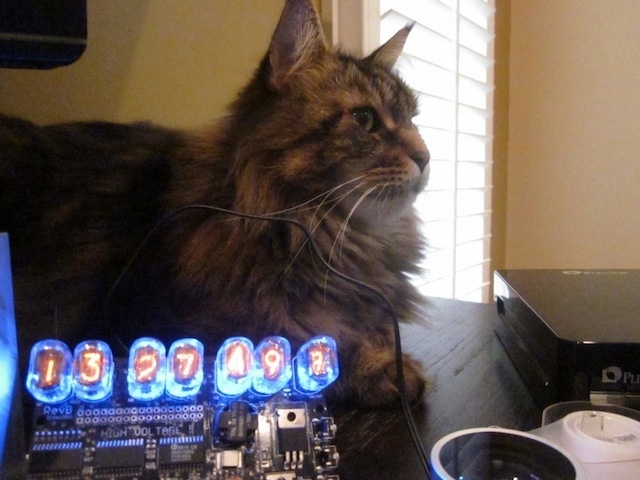 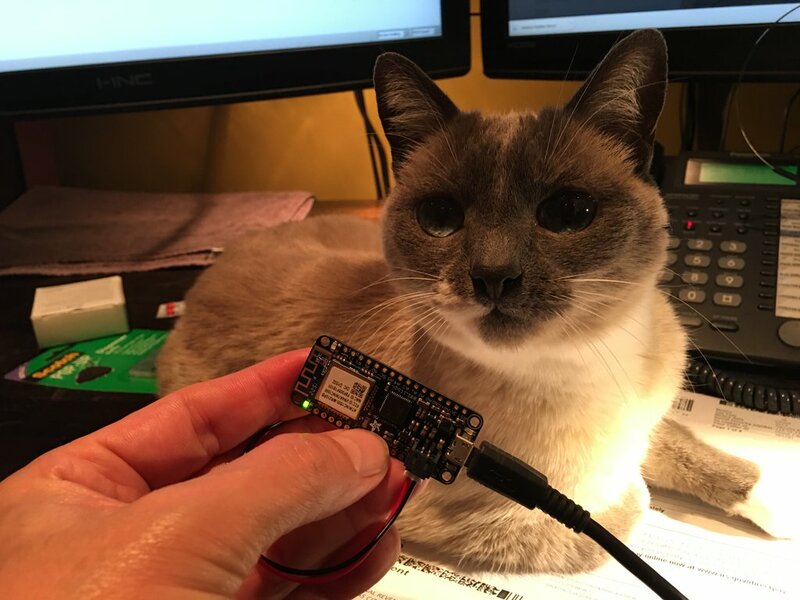 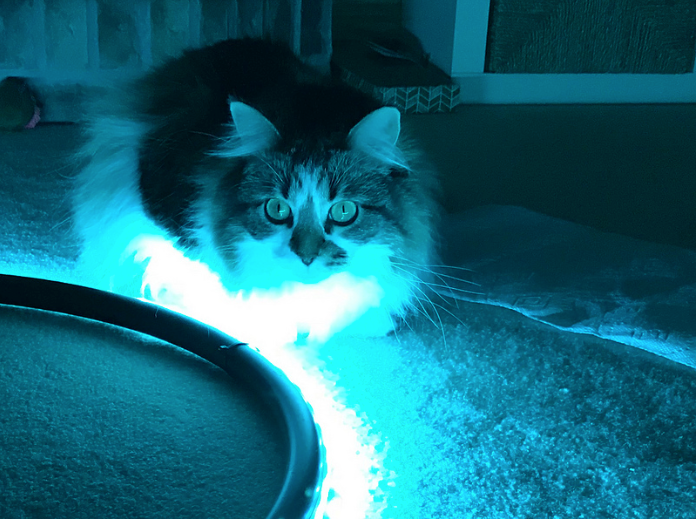 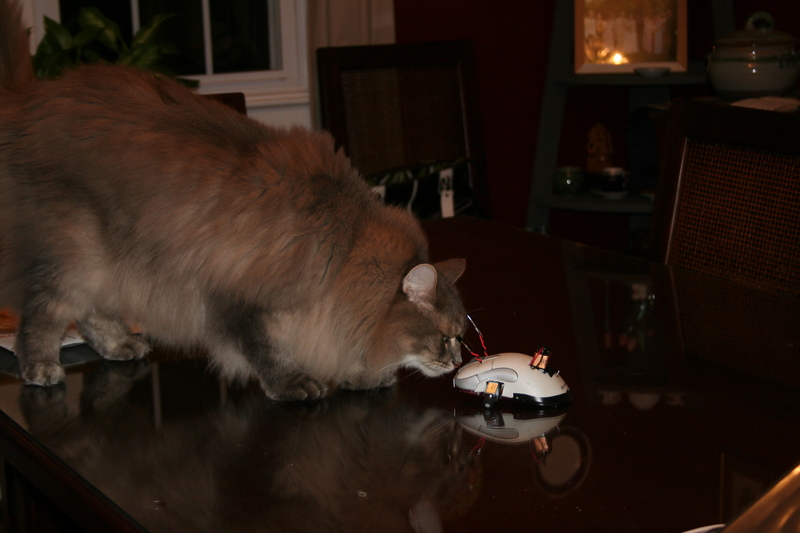 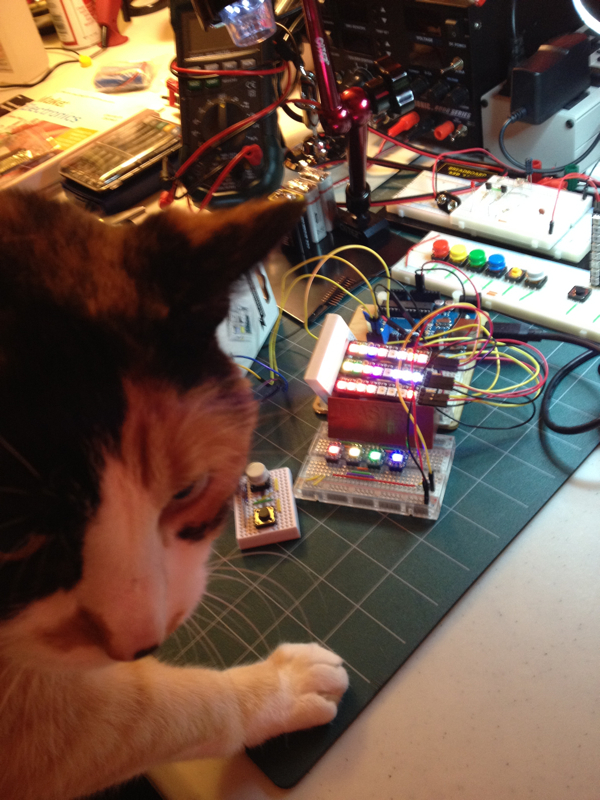 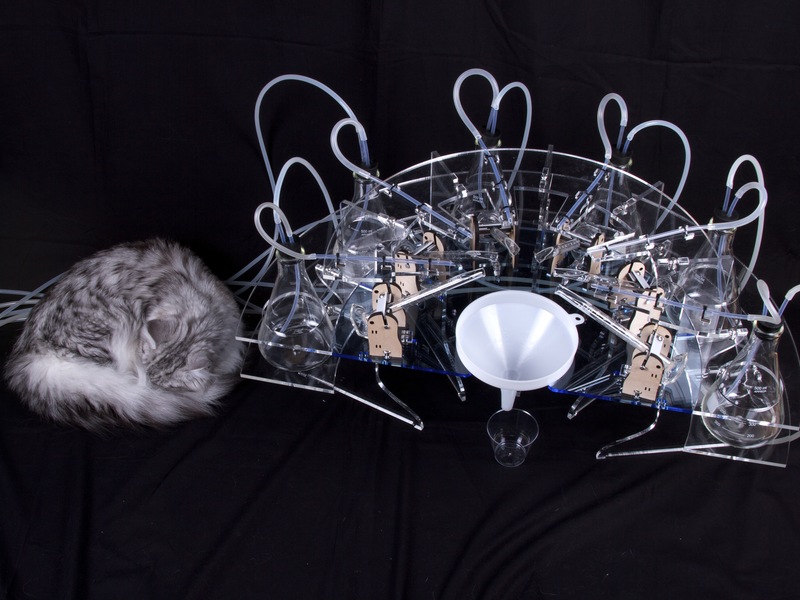 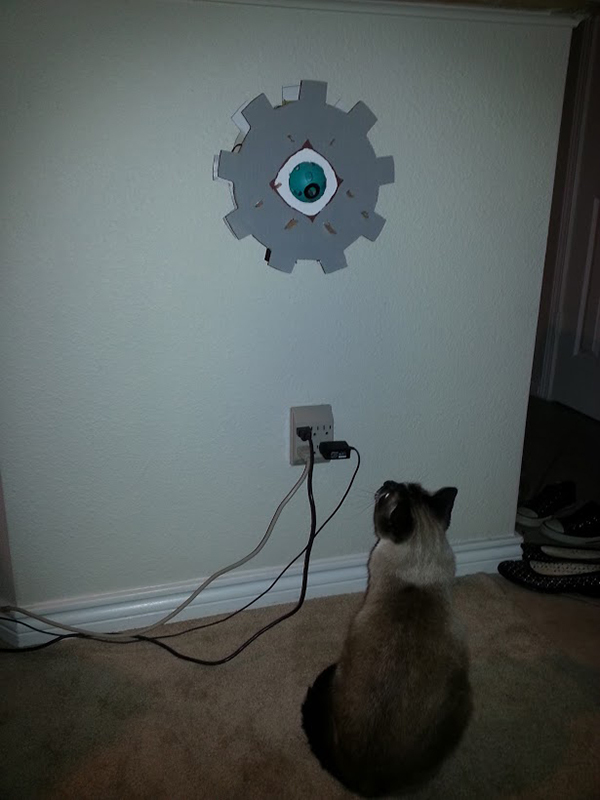 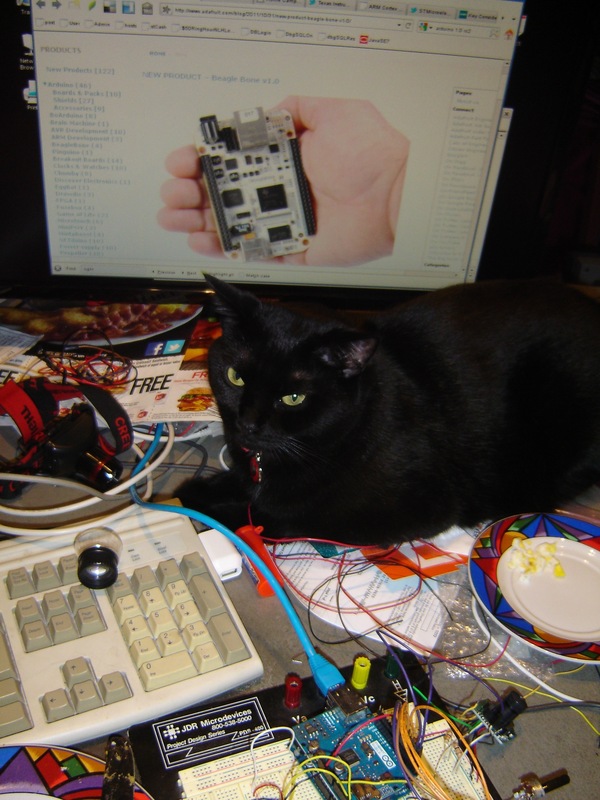 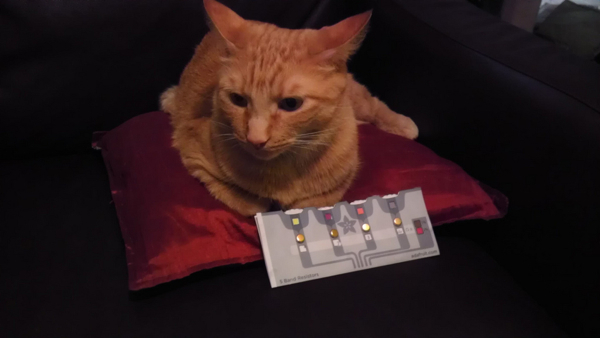 Title: Missy guards her Arduino fireflies prototype. 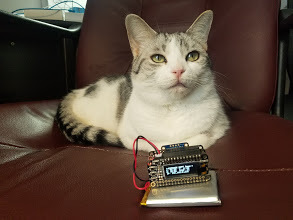 Title: Chairman Humph says, "Go away. 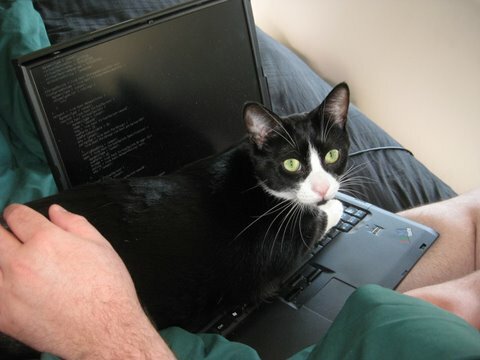 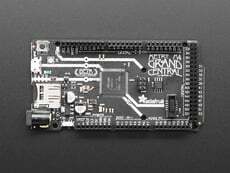 I just did an all-night hack session." 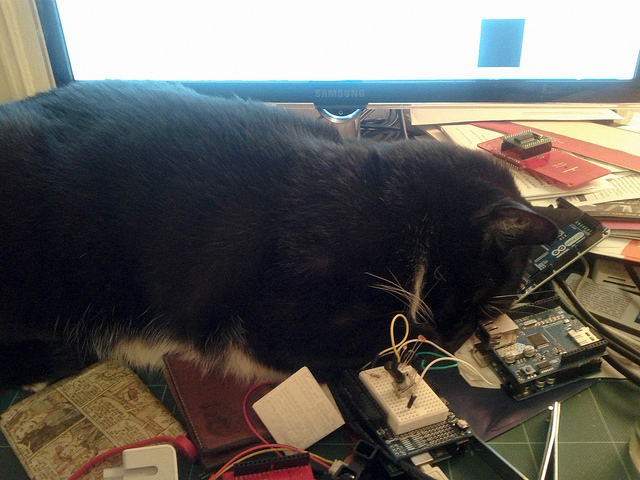 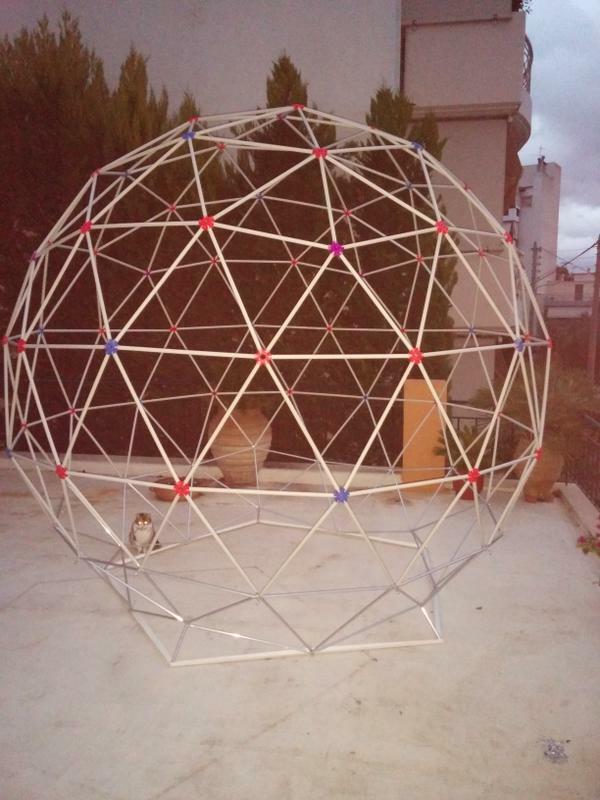 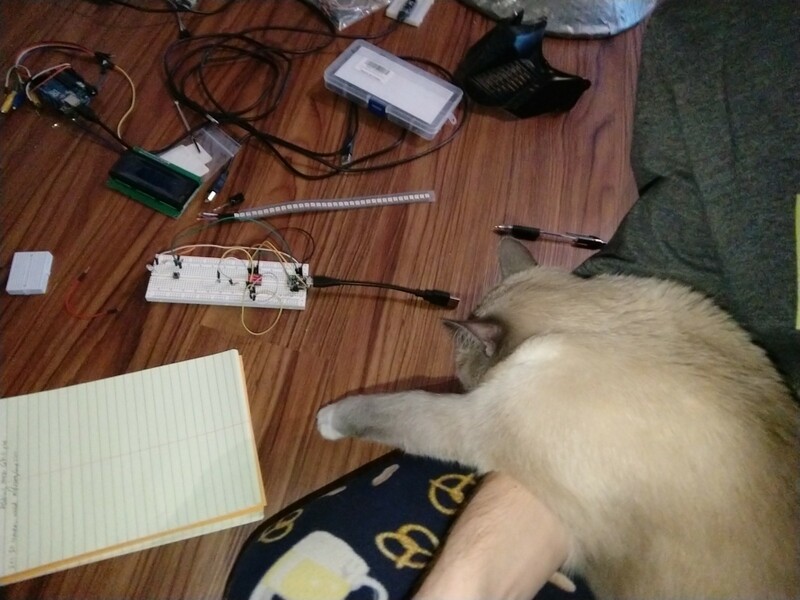 Title: Sweetie Pie helps review an enclosure layout. 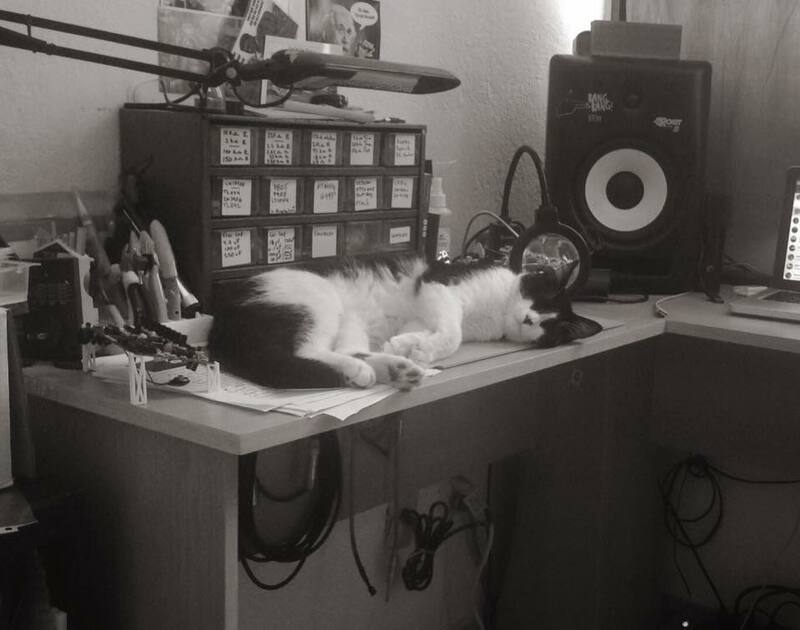 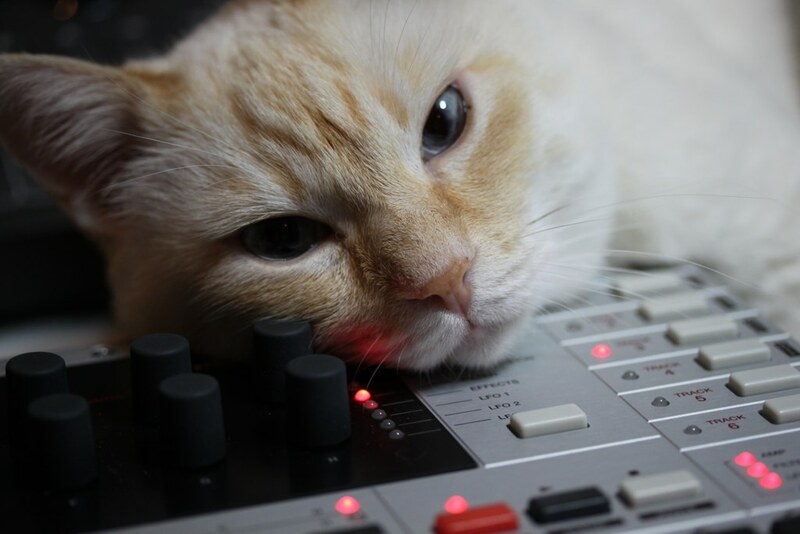 Title: Audio Engineering is hard work! 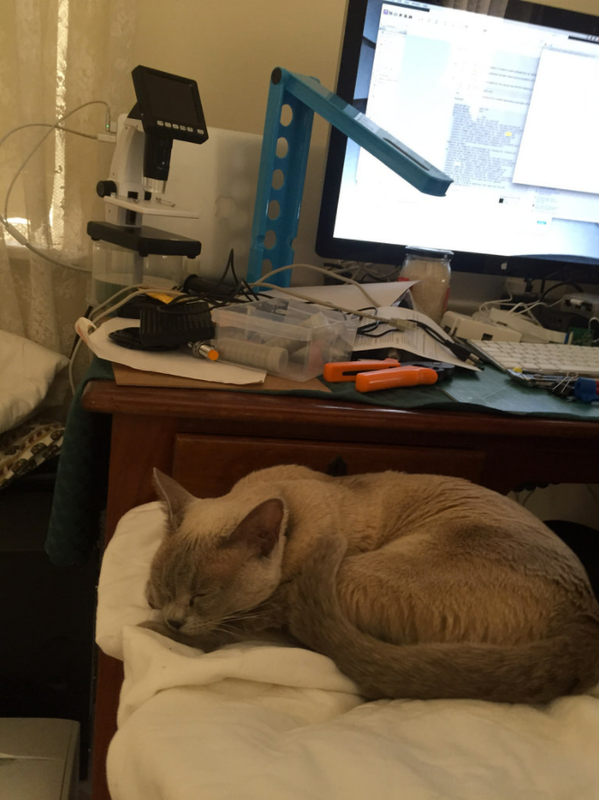 Title: Max, bushed on a lab stool after a long night of testing. 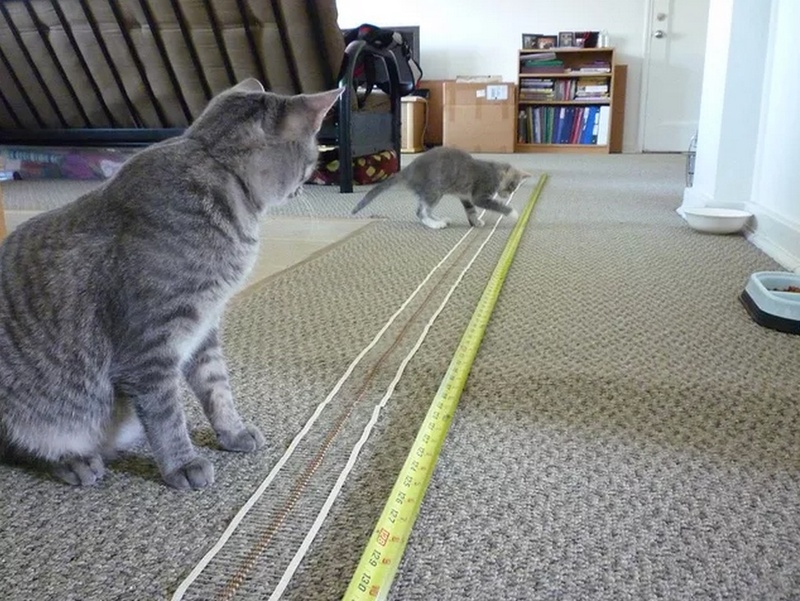 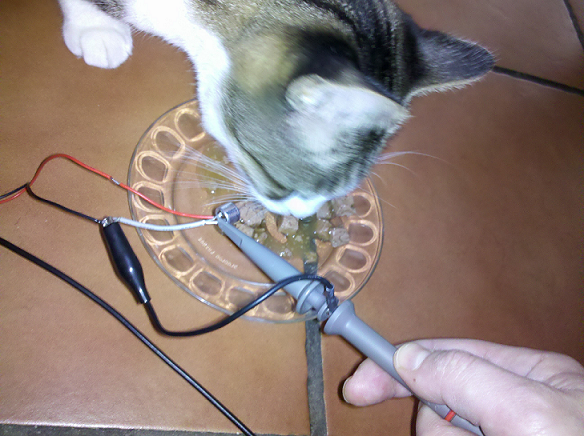 Title: Measuring purr frequency - he purrs A LOT when he eats! 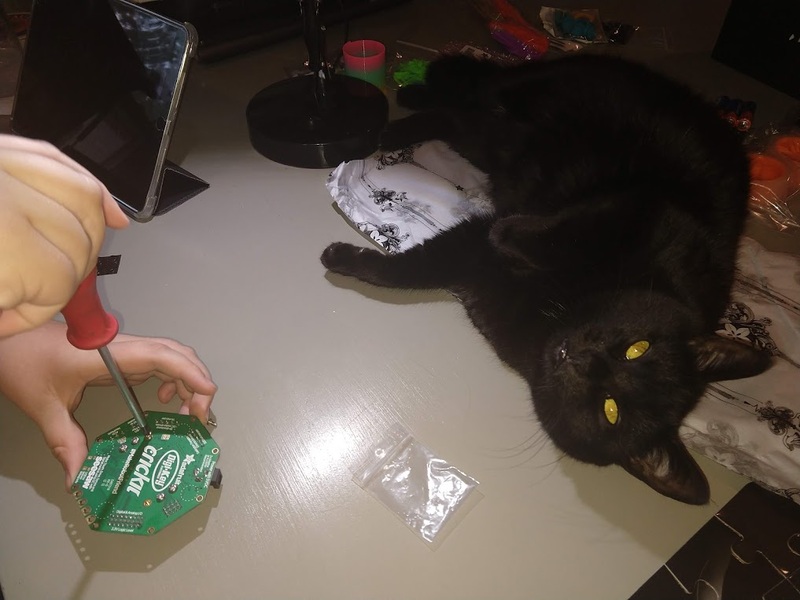 Title: This is what you have to do, see? 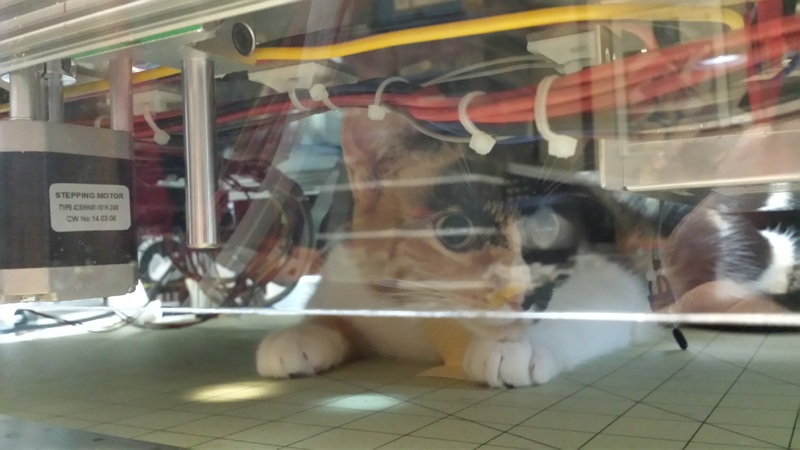 Title: Why is the evalbot comming towards me ? 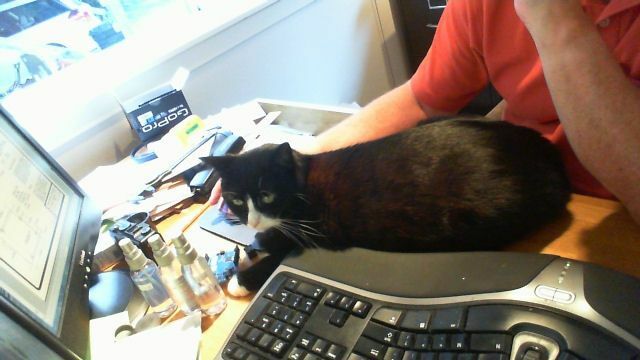 Title: Hey Dad! 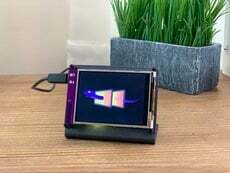 How is your SWR today? 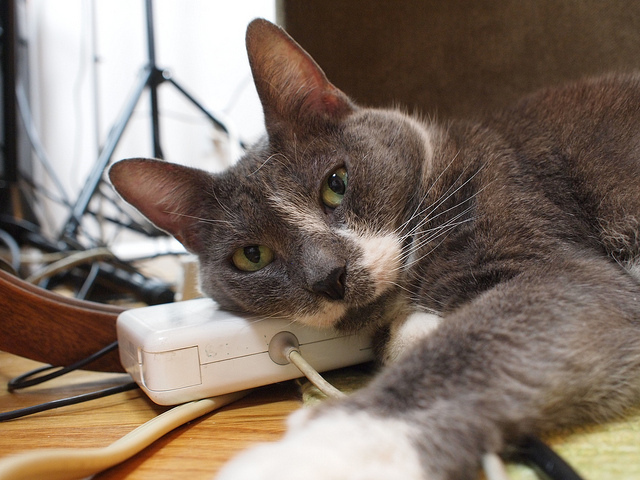 Title: Plug-in correctly? 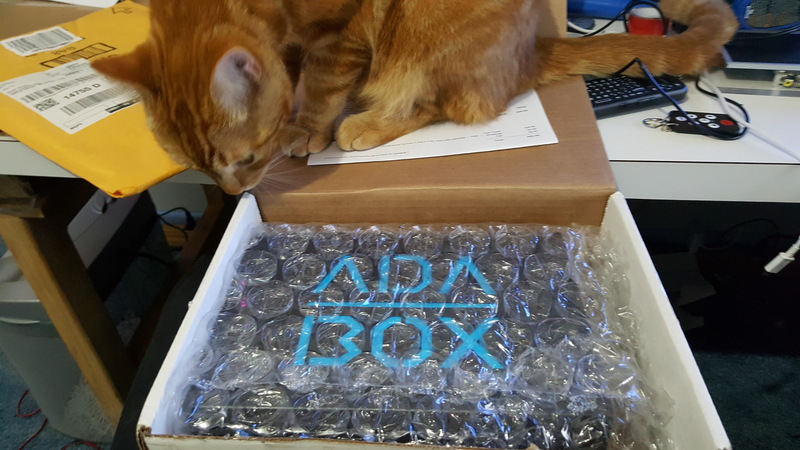 Ladyada may say it is good but I will be the judge of that! 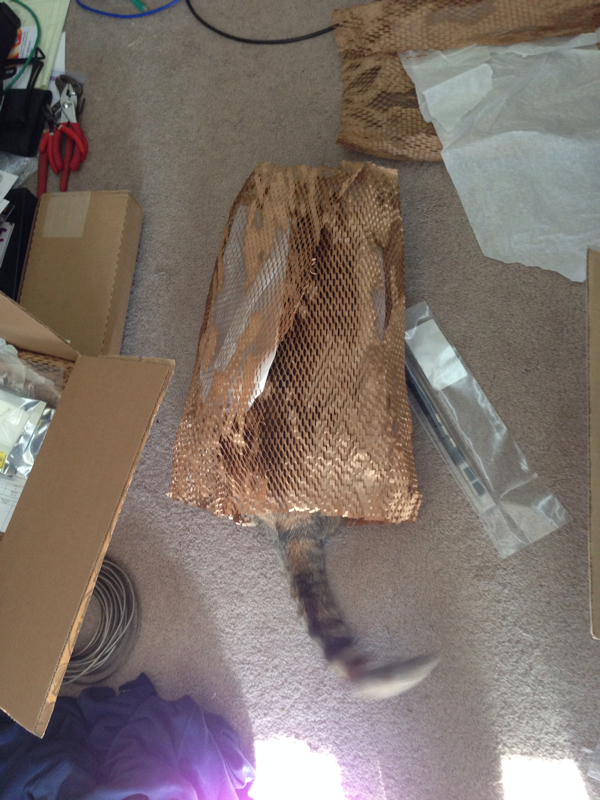 Title: Shi investigates a new box. 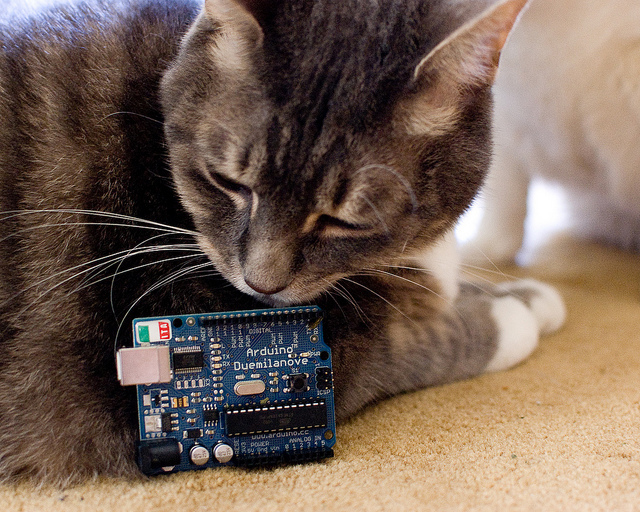 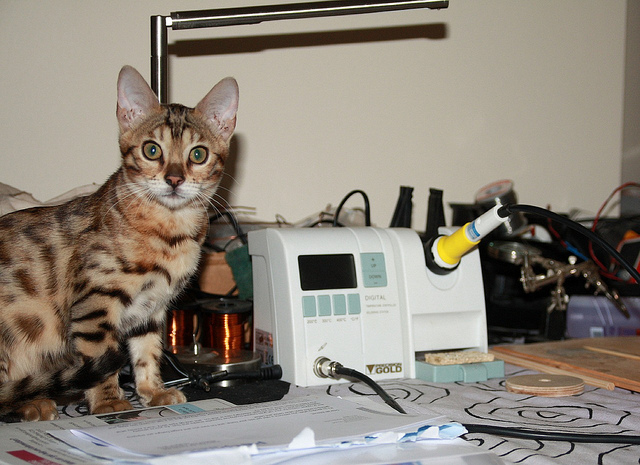 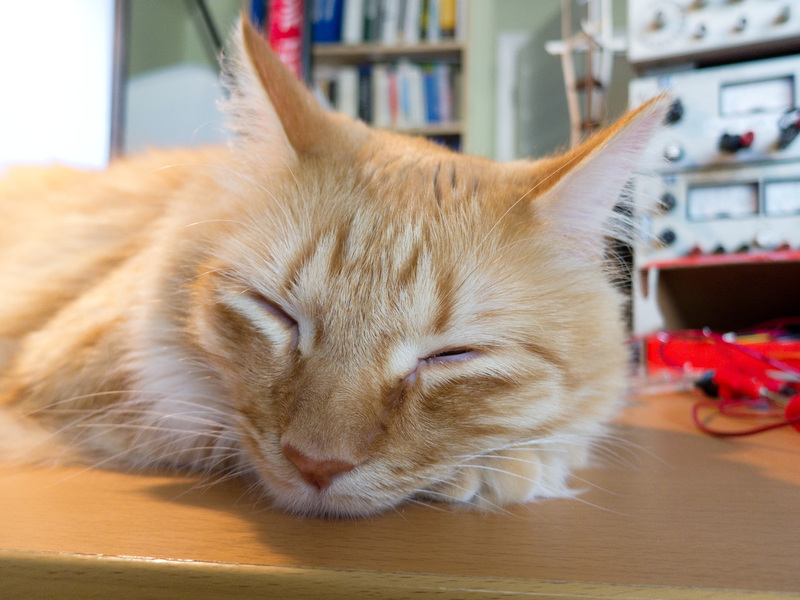 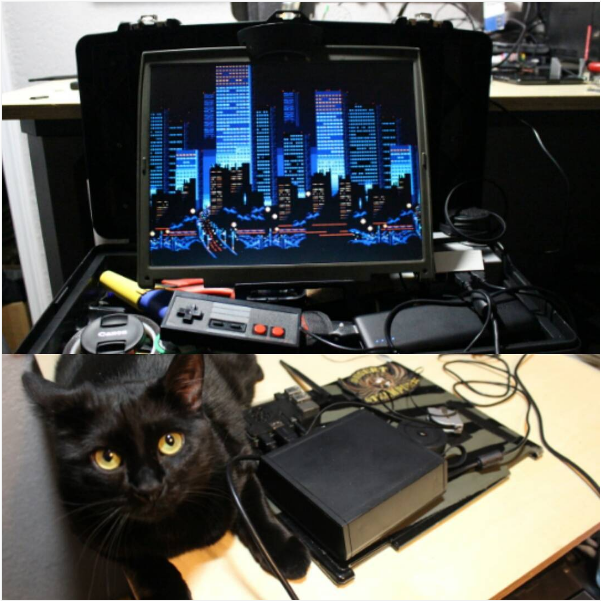 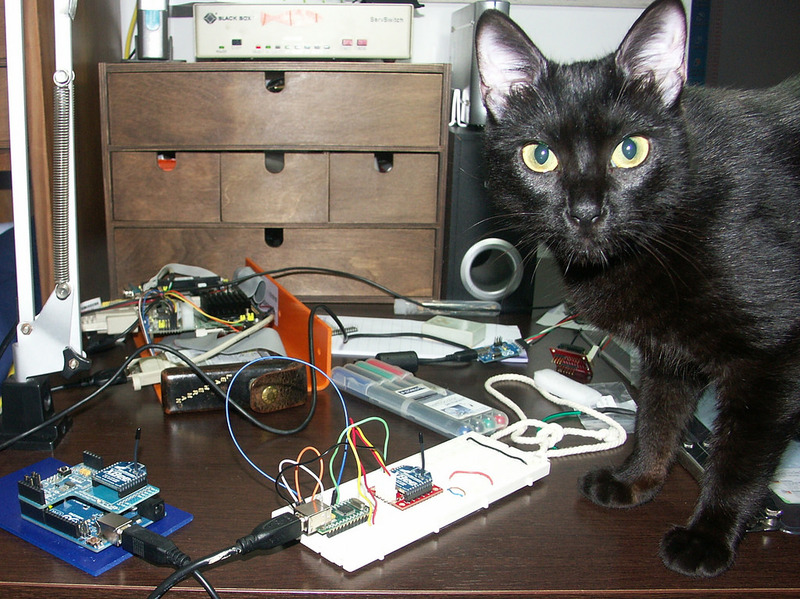 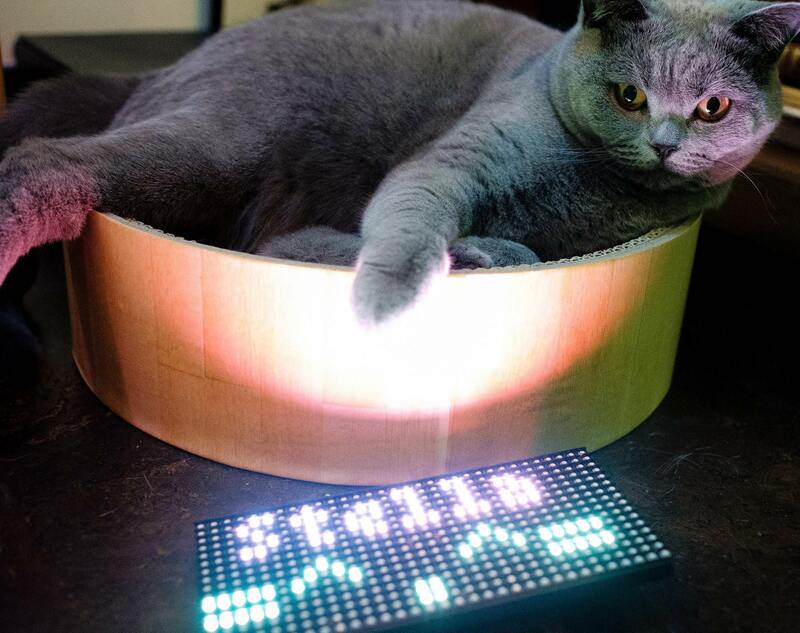 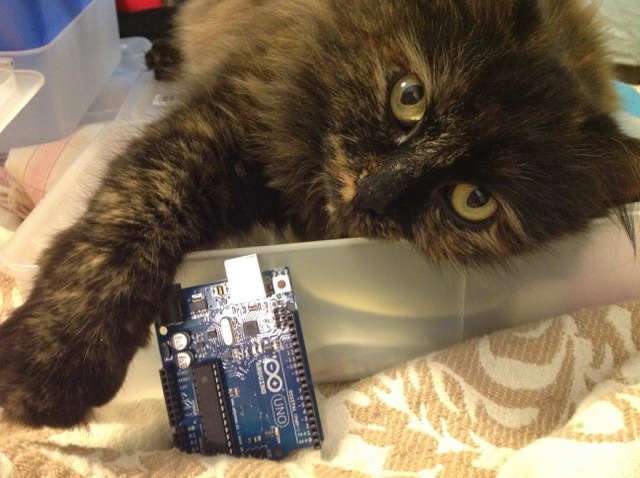 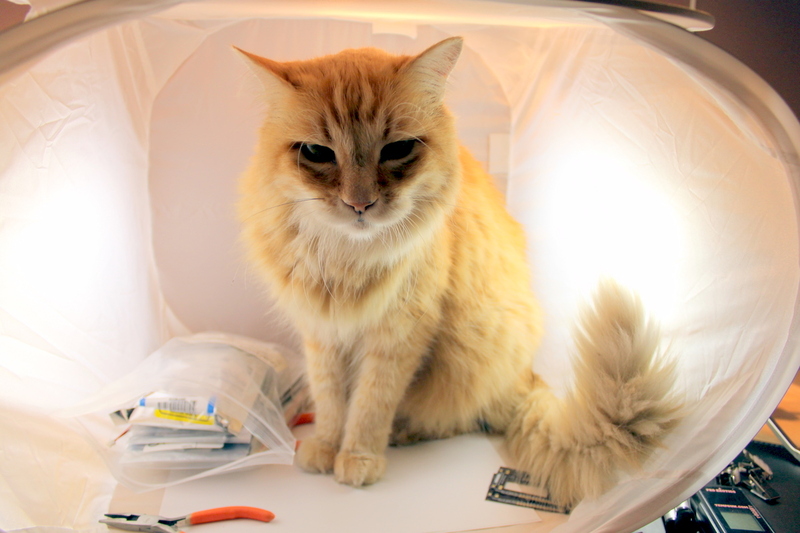 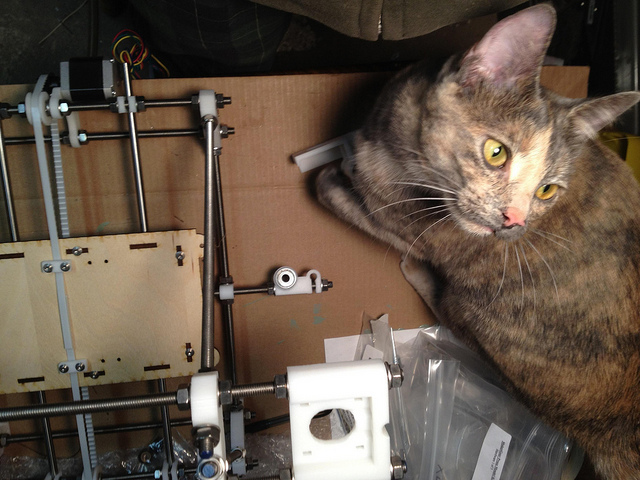 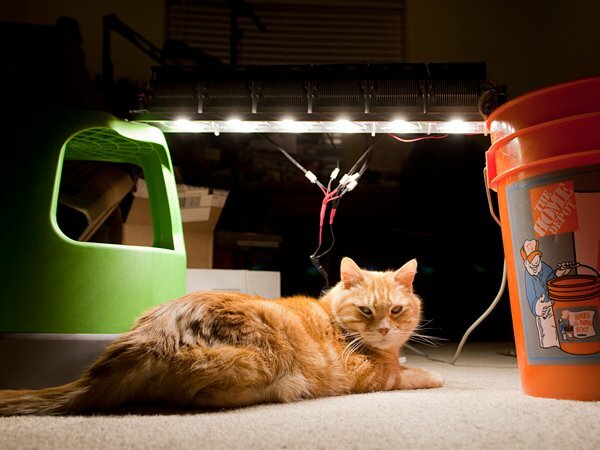 Title: Freyja helping me shoot photos of my first maker project. 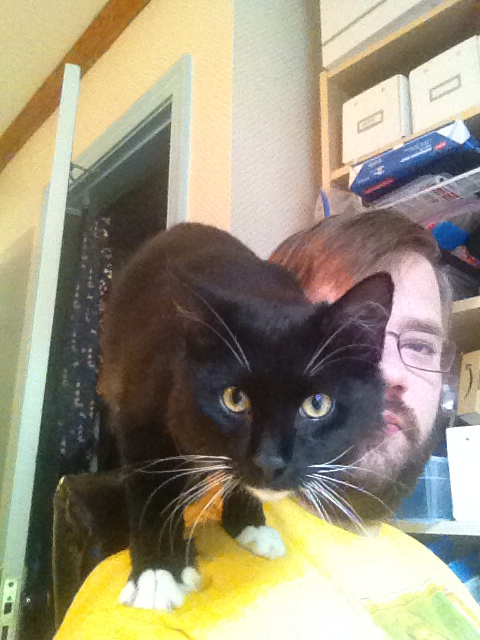 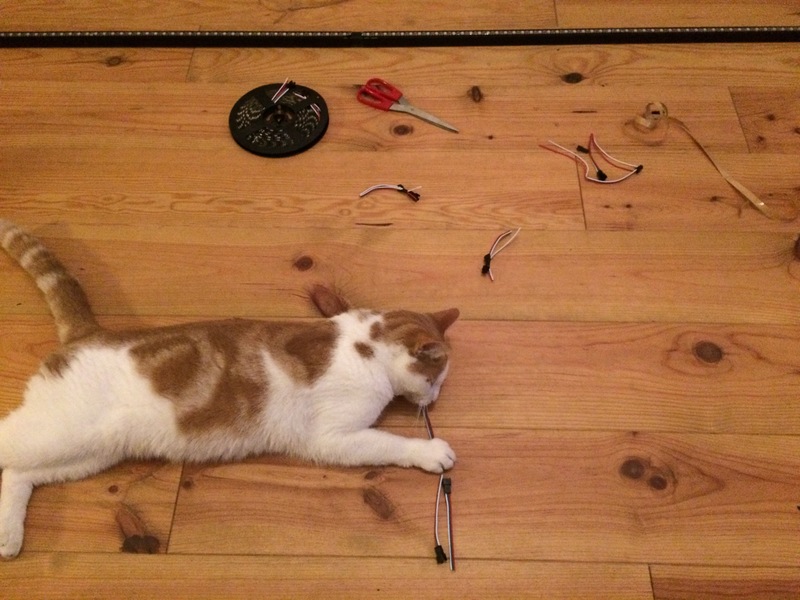 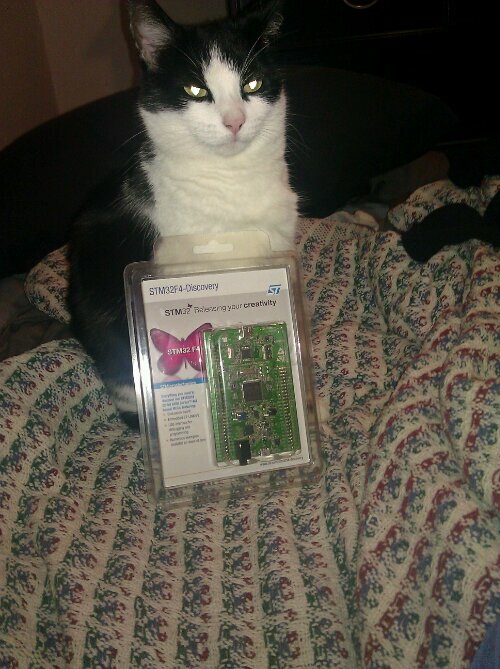 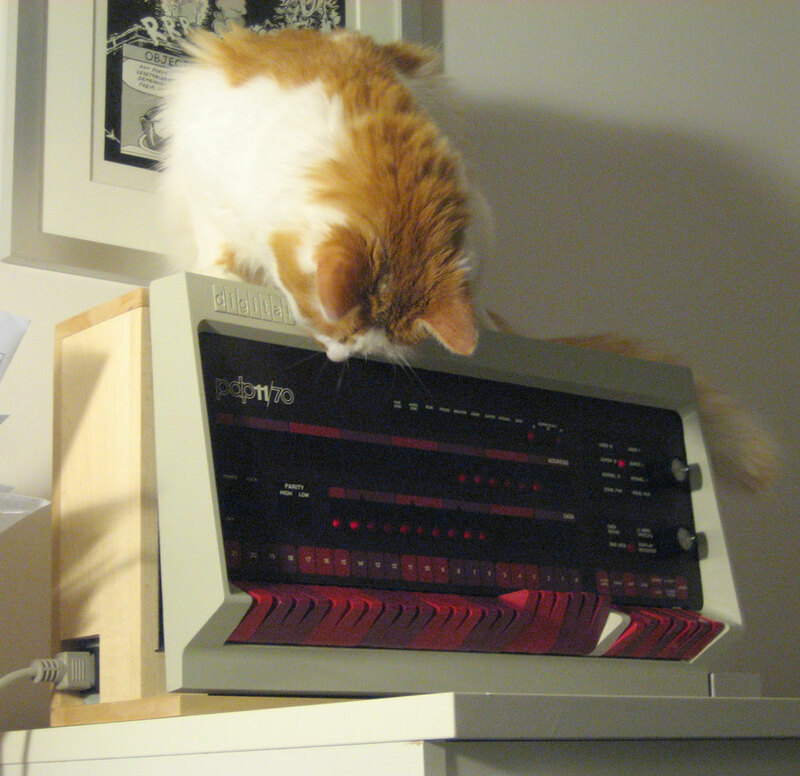 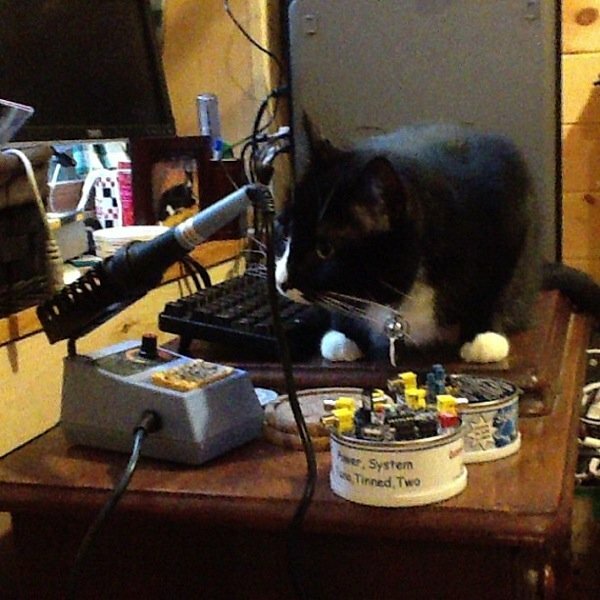 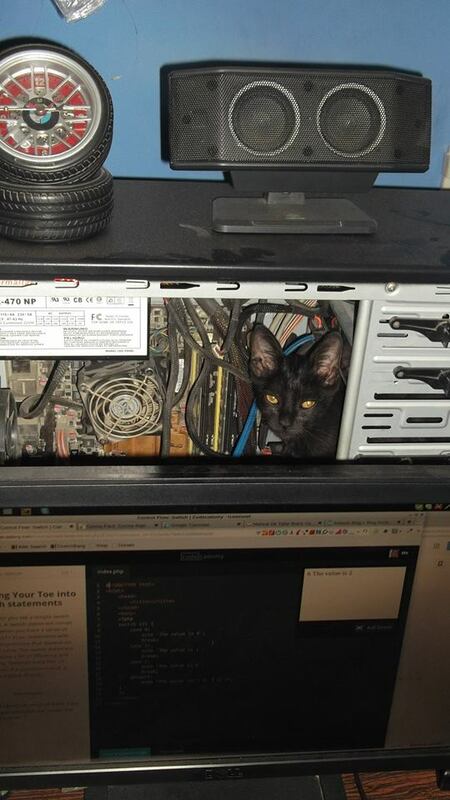 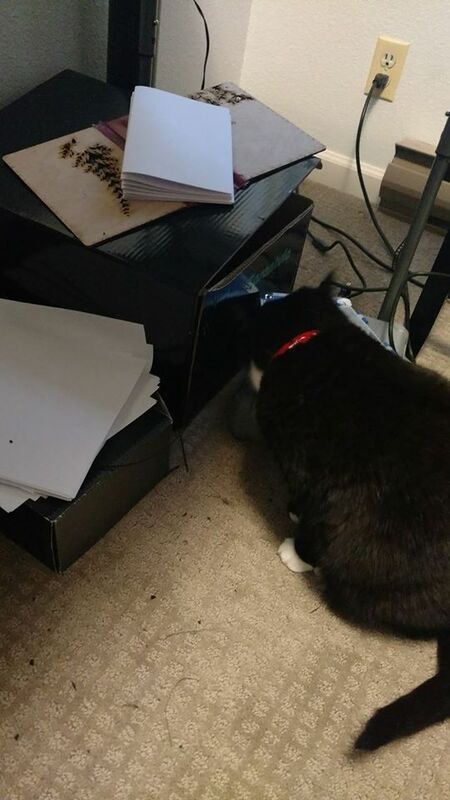 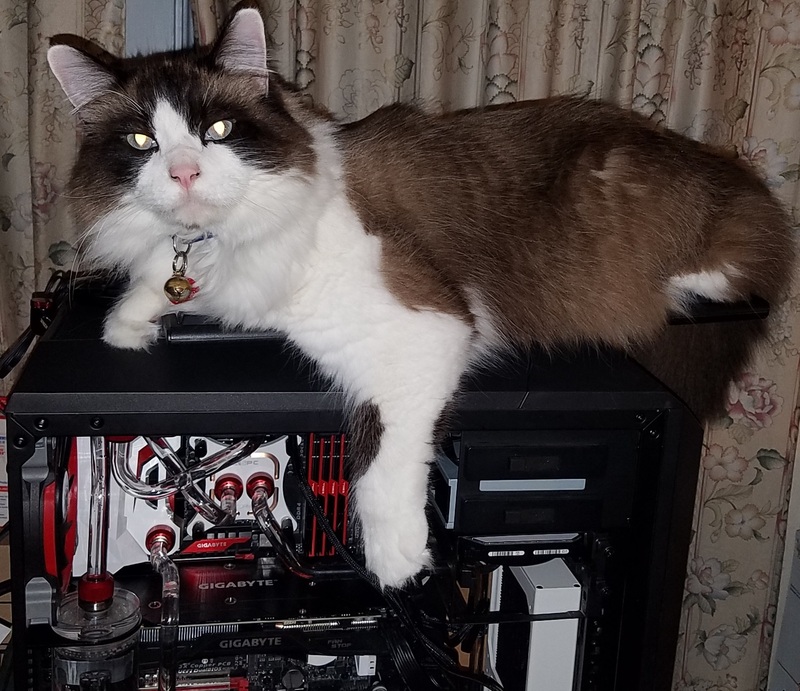 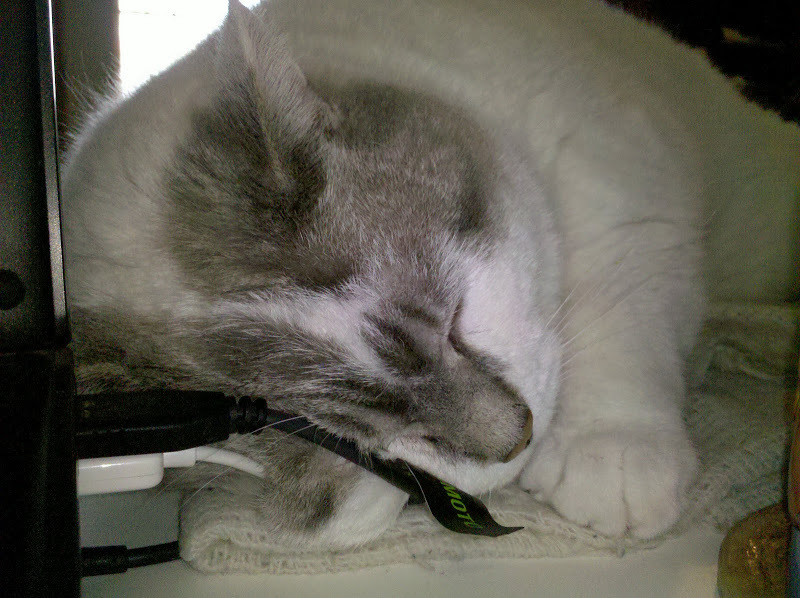 Title: Gizmo critiquing my cooling loop and helping me plan my custom cabling layout. 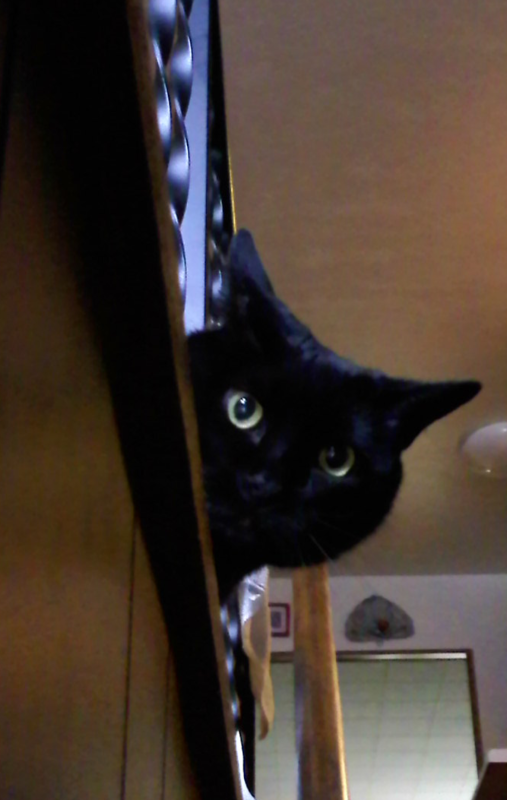 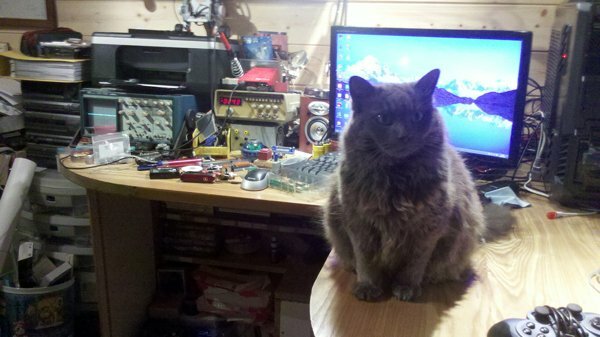 Title: She's curious about the tools under my workbench. 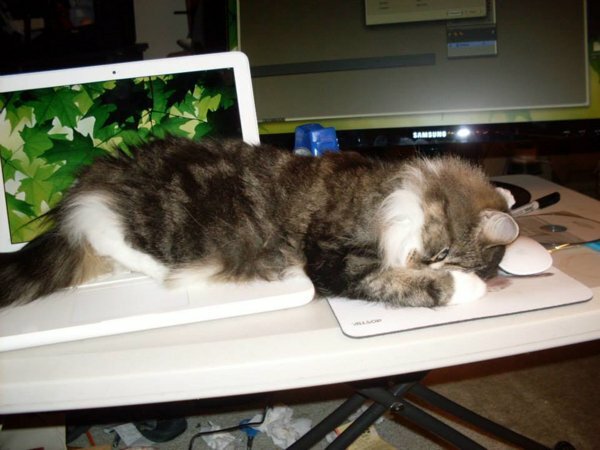 Title: Woke from a nap on a warm laptop! 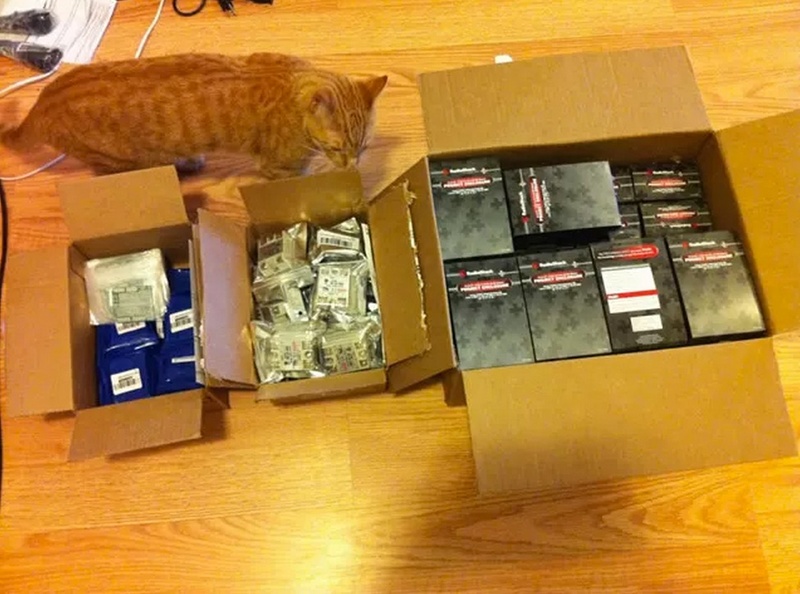 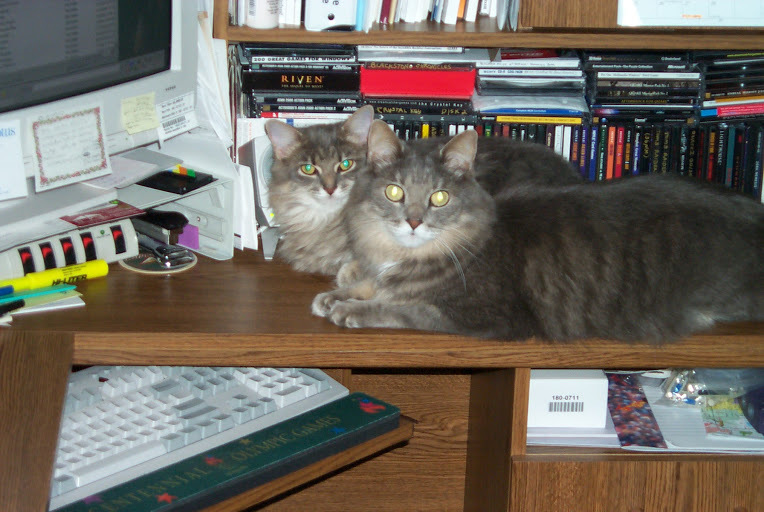 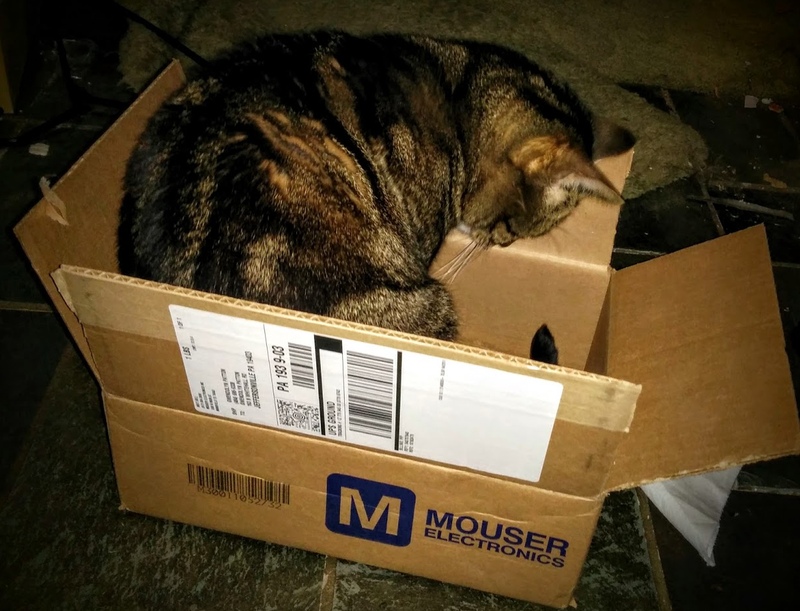 Title: "Our shipment from Mouser has arrived..."
Title: Alright, nothing here ! 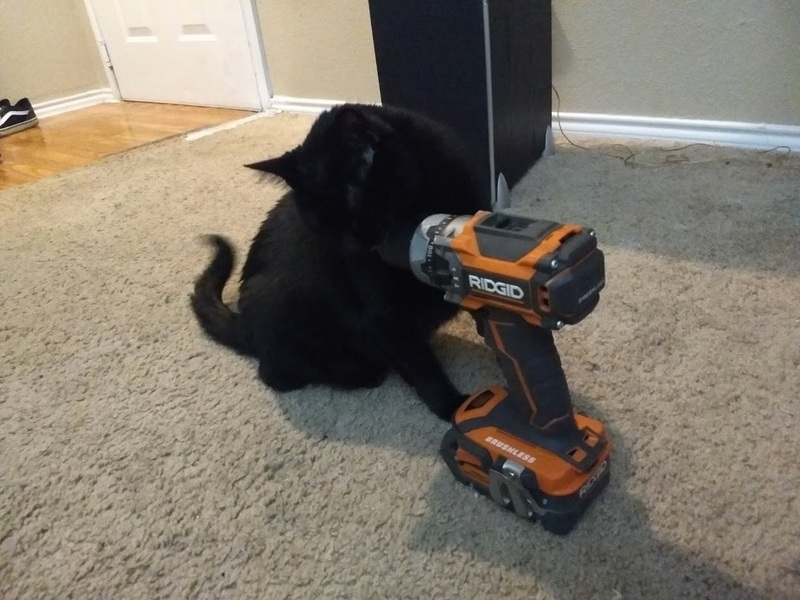 Title: Some animals are scared of power tools, but she knows the drill. 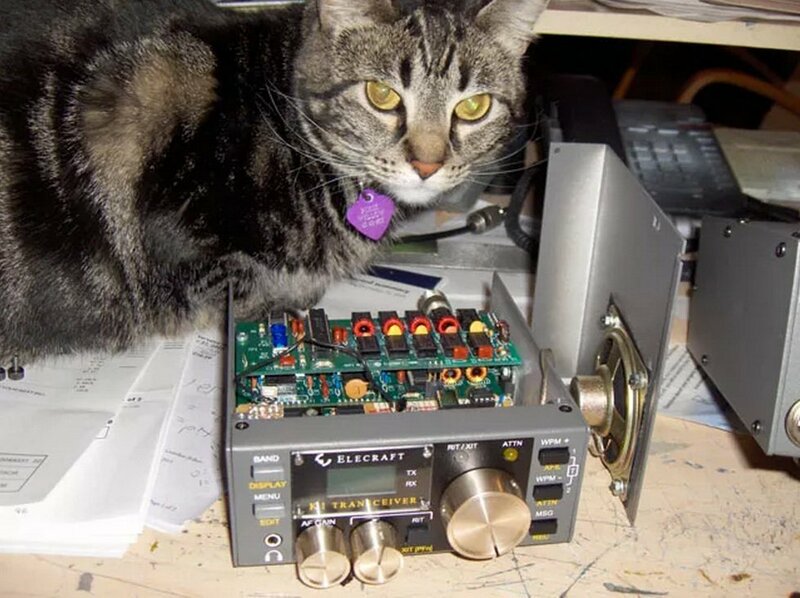 Title: Quality control on strike. 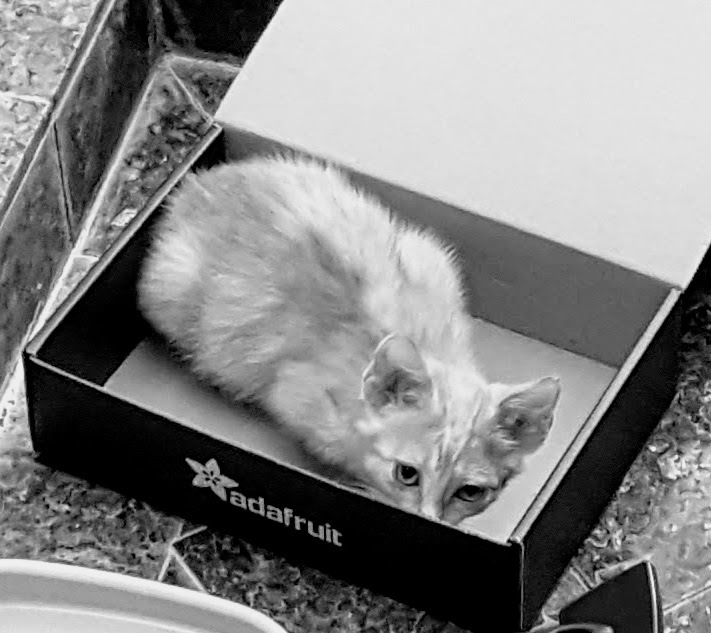 Title: Meet Daisy. 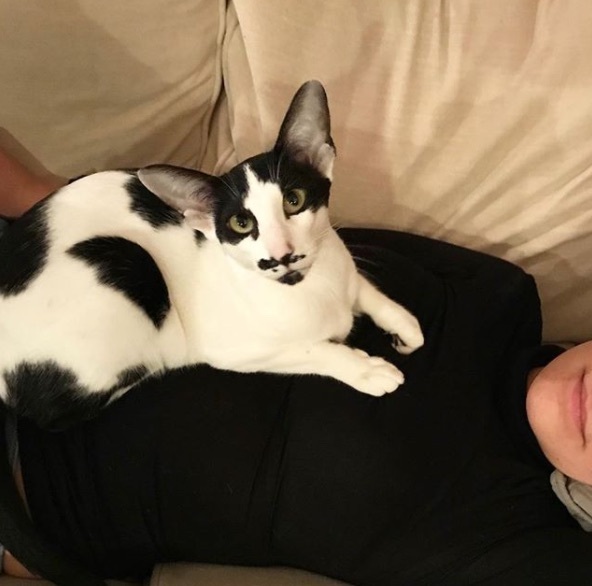 A Salvador Dali inspired oriental shorthair complete with middle finger emoji forehead & undeniable Kylo Ren/Adam Driver similarities.